Do YOU See the Blobsquatch? Film Roll One, Bob Gimlin, Bluff Creek. Left, by the Arrow.Well, We See Demons, Just to the Right in this Image. NOTE: You are looking at PART TWO of the INTERVIEW. FIRST VIEW PART ONE HERE. Also... you might read our previous blog entry touching on Blevins matters HERE. LEROY BLEVINS: First I like to thank you for your time in this matter. Now first I did the research on this film was for a friend at first after finding the things I found in the footage and still photos I had to bring this out. What you do and what I do are two different things and please don't say my research is like MK Davis for I was bring these things out before he started to bring the things he is talking about. Even it was told that the Bigfoot in the film was real however it was just a man in a suit for even I yes I made a copy of this suit. Did you know that you can blog me all you like but the fact all that will do is bring more people to my site. Think about it. And what does Bigfoot have to do with my research is I did real research on the first Bigfoot and the first Bigfoot is told in the Bible. For the first Bigfoot was called Esau, Esau was the first what you call Bigfoot. The Bigfoot has a real name they are Edomites. For Esau was the grandson of Abraham for he was born with red hair all over his body and had a smell he lived in the fields and makes a bitter cry when he was upset. I know more about the Bigfoot then most Bigfoot researchers. And soon and I mean very soon I am going to do what most researcher been trying to do for years and that is film a real Bigfoot and get a lot better photos them anyone has every done. For you see I not only tell the truth I SHOW IT. Let us see what I have found in the past years. I found the location of Noah's ark and yes even other arks and I have real photos of them. I know the true story of Noah and the flood. I found the true legend of what people call Bigfoot. I know the name of the man that wrote the first 5 books in the Bible. I found the true location of the garden of Eden. And yes I have debunked the Patterson and Gimlin film of Bigfoot. Now this was all done in the past 5 years now what have you done? So you see I do research to bring out the truth and I am not like all the other researchers out there I look for the proof to show in my research and all they can do is show words and words are just that words but when you can show real photos that tells the whole story. One other thing when you blog me you better show and I mean show what you like to say about me. For example: You said that was not a hat however you can clearly see it was a hat and I show this you show are words. Bob Gimlin was never in front of the camera that was Roger Patterson the whole time and the footage shows this and again here you are telling words. Bob Gimlin was behind the brush and again I show this for you can clearly see his face behind the brush and here again you think it's not but again that is just words. Just like the stories that Patterson and Gimlin told of that day they change there stories a lot in some interviews they give. Yes even in 1 interview even Bob Gimlin him self said it may have been a hoax. And for John Green again he is only telling things that are told to him this is call hear say. No proof nothing to show to back up there words. As for me well I show it. You like to hear something funny today I did my first walked in the copy of the Patty suit I made and you know I had 9 people with me and they all and even some of the film shows me and the Bigfoot in the P/G film was a dead MATCH the face and body and legs and feet and yes even the muscle movement. And next weekend I am going to do another filming of me with the suit on and you and everyone out there well see that the P/G film was just a Big Hoax. For you see when people see my film of me in this costume I made and see the P/F film they will say it was a hoax for again They will see and the key word is SEE. No one in the world has a copy of the suit however I do and I made it from part that was found in the 1960's and the funny thing is I never made a costume in my life this was the first one I have made and it looks just like Patty suit that Patterson used in his Film. You don't have to believe me and that's OK but soon and I mean soon you will see my film for I show my research and I have thing to show and not just words people say. Remember words are just that words but what you can see tells the whole story. By the wa y you blog me I am going to place this e-mail on my site for all to see so know words will be change. Just remember SHOW ME. the Key word is SHOW. BIGFOOT BOOKS: First, please explain your Hyampom track photo error. See Green's book I mentioned. Two photos, one you used, the other clearly showing the same track cast, made in 1963, on that same wooden deck, by the same guys. Have you been to the film site? There is no red dirt on that sandbar. And if that is Gimlin in the bushes, he'd have to be at least 10 feet tall. It is optical illusions and film flaw and blur that you are seeing? A "horse"? How did you come up with a horse??? 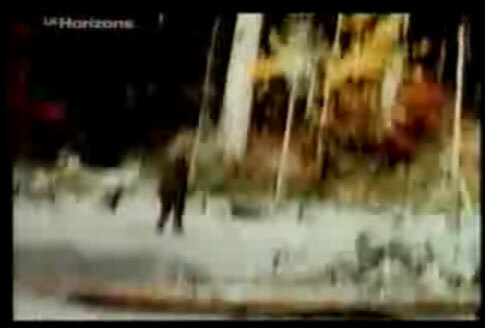 There is blur and a changed perspective as Patterson runs past that log debris and the stabilizes the camera. Now words--they represent thought and logic. They are good. Pictures are not always worth a thousand--they can LIE, too, esp. if one is "seeing things." LEROY BLEVINS: One Bob Gimlin was standing on a hill side behind the brush. When I do my research I look at it with a open mind in all of my research. Even when I go over photos and film I look at it over and zoom in to make sure of what I see then I have other look at what I find before I even show anything. For Example: Bob Gimlin behind the brush. Before I made this claim I looked over the photo and even zoom in to make sure it was a face and not trees or leafs from the trees. Then after you can clearly see the face I match it to Patterson and Gimlin and the face match the same face as Bob Gimlin. Now after I made the copy of the suit I had to have 4 other with me when I was walking in the suit you can not hear nothing in the head piece so I had other stand by in locations to talk to me on when to stop and go. Just like the images of the other men that the film shows yes they took the men out of the footage but the images of the men are still in the footage. 1 you can see this ghostly image of a man they took out but they left the man shadow in the footage. Then the other image of the man was walking across the camera going to the right. Now I show these thing and even when I was going over the work of MK Davis even in his videos you can see the same images in the videos but he never seen them but I did. Now MK Davis video are from the film from Patterson take a look you will see. But when you look over his videos you need to slow it down so you can look at it frame by frame. Let me share something with you. If I was like all the rest trying to make a dollar off of this I would have done a book but I did not do a book I place my research on a website for all to see for free. No I have never been to Bluff Creek and the red mud I talk about is the red mud seen in the footage and you can see it on Roger Patterson paints and in the footage. 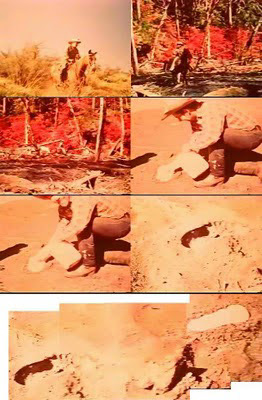 But the photo of Bluff Creek show the ground is all rocks and rocks and gravel but the part of the footage where Patterson is making the cast prints show just red like sand only no rocks no gravel just red sand. The part of where the horse with no rider is at the first shot before you start to see the Bigfoot and I have clearer photos of this. "Pictures are not always worth a thousand--they can LIE." These are your words right. Well if that is true the Film of Bigfoot that Patterson film also LIES. Another thing I like to also point out. 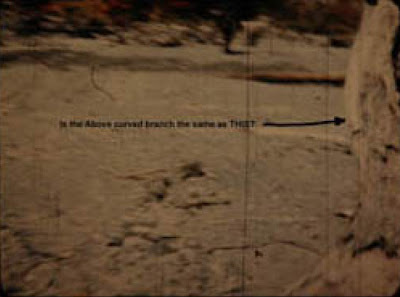 The tree that Patterson was standing by in the footage film at the Bigfoot film site. This tree behind Patterson holding the print in his hand is also found in a photo taken by Larry Lund. 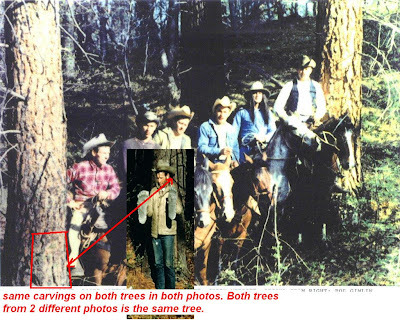 The photo shows Roger Patterson and Bob Gimlin and 4 other men on horses and Roger Patterson is by that same tree that he was by with the prints in his hands at the Bigfoot film site on Oct 20 1967. Now the photo taken by Larry Lund was also taken in 1967 as well. Now it was told that 3 reels of film was filmed that day and this is told by Patterson and Gimlin. Now on reel 2 you can find two other men on that reel shot at the film site of the Bigfoot on Oct 20 1967. Those men are Jerry Merritt and Bob Heironimus and both of these men are on reel 2. Now as I came to this part in my research I look at the photo taken by Larry Lund again and this is what I found out. 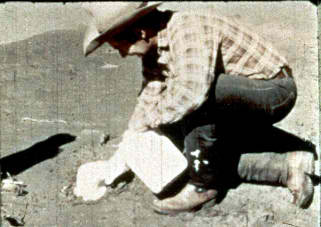 Roger Patterson had the same clothes on in the Photo by Larry Lund and in the footage. Now Jerry Merritt and Bob Heironimus also had on the same clothes on as seen in this photo by Larry Lund and also on reel 2 shot at the Bigfoot film site Oct 20 1967. The question is how can all 3 of these men in this 1 photo have on the same clothes that they have on in the Bigfoot film. The answer is they all was taken on the same day. Yes they had to take the photo and shot the film on the same day for all of these 3 men have on the same clothes in this 1 photo and on the film. So you see as I was going over this film and photos even I came up with some questions that need answers too. This 1 photo taken by Larry Lund show Patterson by the same tree and also all 3 men that are on reel 2 having the same clothes on. So you see you are not looking at it from both sides you are just looking at it from the side of other. Think about it. 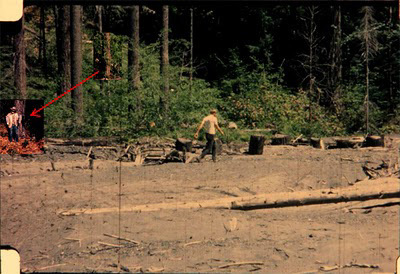 How can Patterson be by the same tree in this 1 photo and film and these 2 other men with Patterson seen on reel 2 shot at the film site on Oct 20 1967 having the same clothes on in both photo and film when they claim that Patterson and Gimlin was the only two there think about before you answer. Photo Courtesy of Larry Lund, not taken by him. Taken on Jerry Merritt's Camera, Near Yakima, WA, earlier 1967. Where did you get your copy of reel 2, and where did you hear about a third reel? The second reel is lost. Those other images were from Yakima, WA. Many film experts have studied the film and found NO tampering. Your imagination seems to be running away with you. And what about Hyampom? Just because a picture CAN lie does NOT mean that it does. I will have to ask Lund. What are YOUR souces for dates, locations, etc.? with Yakima Image on Front. Those Argosy photos of the other guys are NOT at Bluff Creek--I have been there many times. That is Yakima you see. Your theories are more outlandish than the possibility that the film is real! The creature is NOT only five feet from your "bob gimlin" face. Measurements done on-site show 30-58 feet apprx to nearest trees. Bob must be a GIANT! It is optical illusion! Is this "friend" you speak of Dave Paulides, or maybe Tom Biscardi. LEROY BLEVINS: My friend that asked me to look over the film is not Dave Paulides for I don't even know this man and For Tom Biscardi I did not knew him at the time I did my research on the footage. So no on both counts. The question is was you there when they did their research was you there when Patterson filmed the Bigfoot or is it just something you read in a report of book? Now 30-58 feet to the nearest tree You can clearly see in the photos that the Bigfoot was only 5 to 6 feet away from the tree as it walked past it. I did a test on this myself with the suit on. You know there are a lot of stories told on that day and you know this. Just like the 3 reels how I found out about that is by going over interviews by Patterson and even his brother in-law they both claim there was 3 reels shot that day but they only show two of them. And I also like to say that I have talk to Bob Heironimus on the phone and I told him about what I seen on reel 2 and yes he told me the part with Him and Jerry Merritt was filmed was at Mt.St.Helen in Washington and the photo taken by Larry Lund he told me it was taken just 15 miles from behind his house. Now this is what he told me on the phone but you have to do some math with this and why I say this is here is 1 reel of film that shows part of two men Bob H and Jerry M on it and it was shot in Washington and then you see the rest on that same reel with Patterson and the Bigfoot and Patterson making the cast prints on this same reel. So my point is you can not shot just a little on 1 reel of film and stop and take that reel out of the camera and put another reel in and shot that reel and take that other reel you took out and put it back in the camera and start filming again. That reel then would have been messed up by taking it out and put to the side and then put it back in again.Just like that photo by Larry Lund if what Bob H told me on the phone is true that it was 15 miles behind Bob H house and that part of reel 2 was shot at Mt.ST.Helen and this that makes 3 different locations and all 3 of these men having the same clothes on in the footage and in this 1 photo. Come on someone is not telling the truth here. Think about it. Now the place they claim developed the 3 reels of film. I talk to the people at the place they claim and they told me they heard the same story but they have no record of that. So I asked them can they developed these 3 reels on 1 day and even on a Saturday. They told me that they can developed 1 reel in a day but not all 3 reels for on Saturday back in the 60's they only work until noon. Now look at this it was told by Patterson and his brother in-law that Patterson shot the film on Friday Oct 20 1967 around 3 pm and at 6 pm he send the films to his brother in-law and he got the film on Saturday Oct 21 1967 and got the film developed and then on Sunday morning Oct 22 1967 Patterson was at his house and they watch all 3 reels in his basement and there two other men upstairs then these two men came downstairs to the basement and they seen the 2 reels but not the 3rd reel and then on Monday Oct 23 1967 they show the reels to the press at 7pm. Now it was also told by Patterson that first it was around 3pm when they seen the Bigfoot and filmed it and after they filmed it they gone back to the truck to get the plaster to make the cast prints and gone back to the film site filmed some more as he made the cast prints and then they gone back to the truck then into town to send the film off to his brother in-law. Now it was told they was on horse back going to the site and to the trucks. Now look at this it was told that you can not get to the film site my truck or car but you see in MK Davis work they was at the film site and you can see a truck there.Also look at this Patterson and Gimlin filmed this Bigfoot gone back to the truck and gone back to the film site filmed more and made the cast prints then wait for the plaster to dry then gone back to the camp site pack up and the load the horses then gone into town all in the time from 3 pm to 6pm. Sorry but this can not be done in that short of time. Just like in 1 interview by Patterson and Gimlin Patterson told Gimlin in that interview now stop exaggerating. Now why did Patterson tell Gimlin this. Now it was told that after they film the Bigfoot Bob Gimlin gone after the Bigfoot up a hill and around the corner and he heard Patterson yelling for him to come back and then it was told by both of these men that Gimlin was going to go after the Bigfoot but Patterson stop him and told him to stay with him. Now you see when I say words are just that words. For even Patterson and Gimlin story change. Just like you said there was only 2 reels not 3 but Patterson and Gimlin said in a interview there was 3 reels and even Patterson brother in-law also made this same claim. So you see this is going on their words not my words.About the 3 reels who am I to believe you that said there was only 2 reels or Patterson and Gimlin and yes even Patterson brother in-law claiming there was 3 reels? Now that is 3 men word over 1 man word. Again so you see here again you tell one story but they tell another story now where is the truth behind this. Now you can find this interviews on the net and you can even find reel 2 on the net. For it was told in a magazine and even on the net you see it said reel 2 and on this reel you see Jerry M and Bob H going down a hill then you see Patterson with the pack horse going throw the woods and then coming to the that camera. Then you see the Bigfoot part and then you see Patterson making the cast prints and the prints. Now on reel 3 there was only a part they show from that reel and that part was when Patterson holding the cast prints in his hand by the tree. Anyway think of what I said ok.
BIGFOOT BOOKS: OK, first: I meant about the trees--IN THE BACKGROUND, behind the creature, where you say Bob Gimlin is hiding. This: those film site dimensions were well documented shortly after the film was made. I have the various books with the distances diagrammed, and a photo taken from the hillside above showing a man where the creature walked. It is moving basically through the middle of the sand bar, and there is a fair distance between the figure/subject and the background trees. Hence, it was NOT like you show in your reenactment with the fellow hiding right behind in the bushes as you walk by. Those bushes/trees at the edge were about 30-40 feet or more behind the creature/subject, and hence, Bob Gimlin would have to be HUGE to appear to be more or less the same size as the creature/subject in the "image" you highlight. I have never seen an entire Reel Two. There are bits of it in various documentaries, and then still photos in the books taken from these; but in all my research I have yet to find a full presentation of the reel. Where do YOU find it? and HOW do you KNOW that the images of Merrit and Heironimus are FROM that reel? Greg Long's book CLEARLY states that those images are from the filming Roger Patterson was doing up in Washington! Now, about Reel Three: WHERE did you hear about this? I'd really, sincerely like to know your source. There was no third film roll, so far as I know. I'D LIKE TO KNOW ALL THE SOURCES for your statements. You know, as you said, words can lie, and stories can be manipulated or changed; however, in doing research it is CRUCIAL and very helpful to have SOURCE NOTATIONS so that others can VERIFY your statements. This is basic science, basic research technique. Without notations and ascriptions I cannot find out if what you are saying is true or not. I'd really like to give your theories the credit you claim for them--but I've got to have citations to do so. BTW, the creature was filmed at around 1:30, in all the reliable accounts I've read. Bob Gimlin says that they left around 3:30 or maybe 4:00-ish. There are some questions about the timeline after that, as you can see in earlier blog posts I've done, and in the work of Daniel Perez. Basically, yes, that is a very long drive. If they left at 3:30 they could not have gotten to Eureka any earlier than six o'clock; and then how did they get back to Willow Creek by shortly after closing time at Al Hodgson's store? Someone has messed up in the telling of the tale, but I can't say whom, and I won't declare that anyone in particular is telling a lie. I do suppose it is possible, but I don't think Gimlin is lying--he seems to be a very truthful and sincere man, from my personal experience being around him. I, too, as with you, want to know the TRUTH. So, please, what are your sources for the above? And what makes you think that 1963 Hyampom cast is from the 1967 film? AND LOOK: Bob Gimlin is wearing a WIG in that Argosy cover, and in the photo of the group you claim was at the film site. That is his movie costume for his role as an Indian in the Yakima filming. Right there on the cover of the magazine you use as evidence you can see Roger and Bob in their film costumes, up in the hills outside of Yakima. Those photos are NOT from Bluff Creek nor the vicinity--the terrain, landscape and vegetation are NOT what is found in the film site area, and I HAVE BEEN THERE TO PROVE IT. Again, you are conflating one image/film with another, but they WERE FILMED AT DIFFERENT TIMES. LEROY BLEVINS: This is the site where you can see reel 2. After the first photo of Roger Patterson the one when he is making the prints cast you will see click here and then you will see at the top reel2 and the video in on that same page. I will find the site where you can get copy's of Mk Davis videos. BIGFOOT BOOKS: Well, that isn't the actual Reel 2, the reel that was taken AFTER the film was made. Reel 1 is what we know as having the bigfoot on it. They took scenic stuff in various places, and then the last minute of that reel is the bigfoot. Then, after, Roger switched in a new reel and filmed that tracks, etc. This Reel 1, as I am calling it, is shown BEING SHOWN ON THE PROJECTOR by John Green, in his house, for the documentary host. We see the footage of Roger and Bob riding around, then the scenery shot, then bigfoot, then it ends. THIS is Reel 1. The REAL ONE. THIS IS AN ASSEMBLAGE OF FOOTAGE, copied from copies of copies and in very poor condition re. color etc. OBVIOUSLY: this was JUST some clips assembled for a documentary film someone else was making. The post-bigfoot things in here are some of the bits that are known to us of Reel 2. The rest of that reel, besides the few other snippets preserved in documentaries, is lost, or in someone's storage warehouse. This "REEL 2" is NOT the real Real 2. It is only a little over a minute long, besides, not five or whatever the reel would have held. IT IS NOT EVIDENCE OF ANYTHING out of the ordinary given story, I have to say. LEROY BLEVINS: Ok here is another thing I like to point out. I am sending a photo with this e-mail so you can look at what I am talking about. It was told in a interview; Patterson was the man with the camera however they only show Patterson in front of the camera and never Bob Gimlin. Now they told the story of that day that Patterson was filming Bob Gimlin going down the road with the pack horse and that Bob Gimlin was with the pack horse and Patterson had the camera. But by looking at the footage you only see Patterson with the pack horse not Bob Gimlin. Back to the story Patterson was filming Bob Gimlin going down the road with the pack horse and as they both made the turn they seen the Bigfoot. But however the part they claim with the man going down the road with the pack horse was Bob Gimlin is not Bob Gimlin it was Patterson. Now I took frames from each part of this footage and looked over them and the man the footage shows is only Roger Patterson not Bob Gimlin. 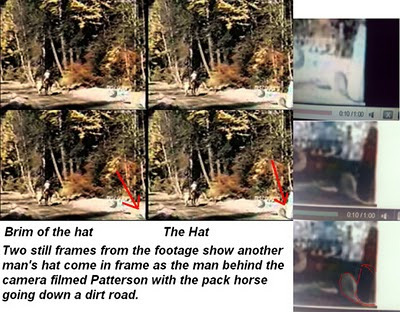 The footage only shows Patterson with the pack horse not Bob Gimlin. For by the frames you can see the man going down the road with the pack horse has the same clothes on and on the same horse and also riding the horse the same way. Now they claim and it is told that was Bob Gimlin when it fact it was Roger Patterson. Last night I gone back over some of the parts of the footage in slow movement looking back over some of my research. Now this time I even had some one look at the videos as well. Now I set my nephew down and asked him to look over what he see in the videos and write down the things he see. Now he know nothing about my research on the film The only people know about my research on the film in my family is my wife my kids don't even know that much about my research for we don't talk about it with them. So my nephew looked over the videos and wrote things down he seen in the video. Now the man that my nephew works with was also here and I took him to the side as my nephew looked over the film and then I as k him to do the same thing. Now these are two other men that never even seen the footage before and they know nothing about Patterson or Gimlin or the film it self. and here is what both of them told me what they seen. 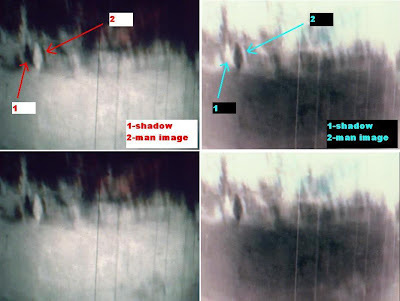 They seen a image of a man taken out of the footage so I asked them what they made this claim and they show me part of the video and said see the shadow of the man right there. And then they told me about the image of the man walking off to the right so I asked them where do you see this and they point to part of the video and they said see this image shape like a man walking. Then they also told me in two part of the video they seen the this thing stopped. So I asked them to show me and also asked them why you say this. My nephew said you can see the thing stop and he count the frames and in 7 frames this thing was just standing there and then it started to walk again. Then he said right here you see the this thing stop and count 39frames and the Bigfoot is still in this 1 spot. So you see the thing stop two time and just stand there with it's hand to it's side.Now the thing they are talking about is the Bigfoot for they did not knew they was looking over a Bigfoot film. However what I am trying to say here are two men that never seen this film before and they both seen the same things as I point out. Now the funny thing is I did not knew myself about the second time the Bigfoot stopped however they did and when they show me it was there the Bigfoot stopped in this 1 location and then you see the camera going up and down and showing the ground then you see the bigfoot again and that Bigfoot was in the same spot and I count and it was 39 frames. But my nephew friend said it was 41 my nephew said it was 39 but it was 39 frame. 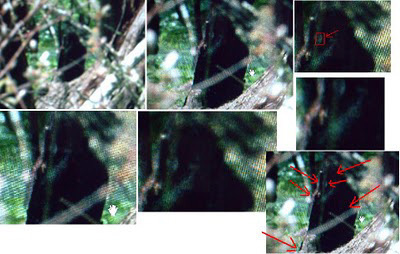 Now the part of the footage I am talking about is after the first part of the Bigfoot when they first seen it. As Patterson was running with the camera and you see the ground well just before you see the part with the ground you see the Bigfoot stop and then you see the groun d will as the Bigfoot stopped start to count the frames The Bigfoot stop then you see the ground then it shows the Bigfoot again after he stop running this Bigfoot in still standing in the same spot and then it started to walk again.Now these men don't do research of any kind and even they seen these thing I point out and even point out something I never seen before. So you see if this film was real as they claim it to be then why was they so many flows in it. Why is there images of other men in the film? why did they took these image of them out? 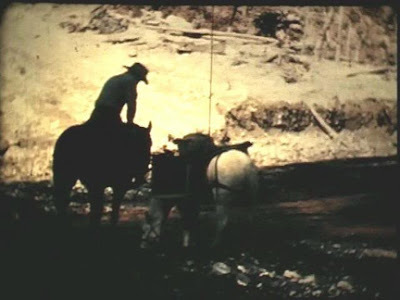 why was it told Bob Gimlin was with the pack horse when the footage shows Patterson with the pack horse? Why did the Bigfoot stopped these 2 time and just stand there? Why does the 1 photo show Bob Gimlin standing behind the brush when it was told he was on his horse the whole time? Why did the Bigfoot had two different feet? Why did the Bigfoot stay out in the open when it can get out of site fast by going into the woods? Why show part of the film with these two other men from another location in the film? Why did Bob Gimlin claim it may have been a hoax? Who was the other man hat in the film? These are just very little questions that no one can answer not even Bob Gimlin can answer these questions. So you see I point out what can be seen in the footage not going on what other tell. I SHOW parts of the footage that shows the things I found in the footage. I am not just telling a story or report or even a blog. I am showing what is in the film it self and not just telling words. I show two frames of this hat and also point out where they can be seen. 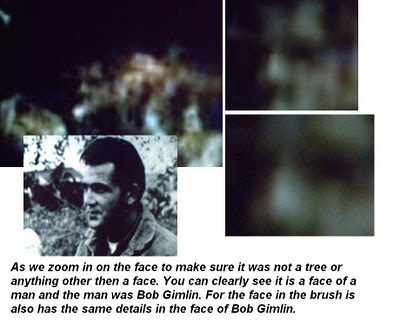 I show the photo of the Bigfoot and the man behind the brush and a photo of Bob Gimlin back in the 60's and they both have the same face. I show Patterson in front of the camera the whole time and you do not see Bob Gimlin at all in the film. So who did the filming? I show the image of 1 man standing there in 3 frames they took out and you still can see this man shadow. I show a image of a man walking off to the right in the film and bends down. I show side by side of both feet the left foot is a different shape and no toes the right foot is like a man foot with toes. I show the outlines of the shoulder pads in the costume. 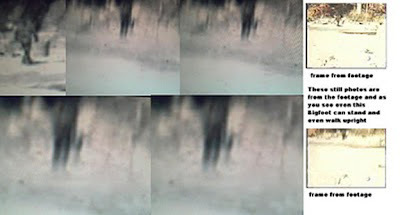 I show still from the footage showing the Bigfoot standing upright and even walking upright. These are just some of the things I SHOW from the film not from reports or interviews or blog this is all from this film. Just this little bit I show, shows the proof of this film is a hoax. For the only thing that can show if it is real or not is the film and the film shows it was a hoax. Now I say this is you can see parts of the film and say will this was from here or there and you can even say the story behind this part of the film. For you see these are just stories now the parts that stand out the most is the Bigfoot part of the film. and these are Bob Gimlin behind this brush as the Bigfoot walked passed him. The image of 1 man and his shadow still can be seen. The image of the man walking off to the right and bending down. The Bigfoot standing upright and walking upright. The film shows exits for the Bigfoot to get out of sight fast but this Bigfoot stayed out in the open like it did. The Bigfoot stopped in two different spots.The ground shows plywood on the ground for camera stands or places for Patterson to stand on as he filmed the Bigfoot. So my point is before the Bigfoot or even after the Bigfoot they can say this or that back to story telling. But the parts with the Bigfoot and they can't say nothing about it was real this 1 part of the film would have no flows and nothing taken out. However this part of the film shows all that I tell for you can see these things. Like the Bigfoot costume you can even see by the photos and film it was a costume like the outline of the shoulder pads the outline of the man arm the two different feet the seam from the leg to the hip. and more. So the big part of the proof is the part where it shows the Bigfoot in the film not the part before or after this 1 part shows more flows then the parts before or after the Bigfoot. The part with the Bigfoot shows in fact it was put together as a hoax. 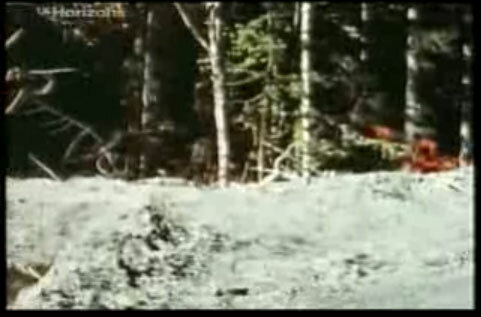 I like to point out that Patterson and Gimlin claim they was the only two there and Bob H claim there was only the 3 there but the part with the Bigfoot shows you kno w the man behind the camera that 1 the image of the man that they left his shadow in is 2 the image of the man walking off to the right that makes 3 now the man in the Bigfoot costume that makes 4 men. So you see this part of the film shows 4 men there not the two as told. That's why I say stories are words but what can be seen is a different story. I like to say some thing. Have you ever think that why MK Davis is making different claims today by coming out with what he is telling. For he just started to say things like there was more men with Patterson and he calls the film PGT film and not the PG film. For at first he was behind this film tooth and nail until I came into the picture last year. For I hear in 1 interview by MK Davis before he started to make the claims he does now that some one called in this show he was on and said there was a man that seen a hat as Gimlin was going down the road this hat come in and out of frame. MK Davis said I need to look at that I have not see it but I will look and see if I can find it. Now I heard this interview just to make sure this was true or not and it was. Then when I came out with my other research I started to look over his research like I made the claim there was more men at the film site that day then 3 month latter MK Davis come out with there was other men there that day. So you see MK Davis gone off ...like they said after I came out with what I found in the footage. Even today MK Davis youtube accounts are gone. His research and videos are not on youtube no more. So he is trying to come up with some thing else to say about that day to make people still think the film is real and not a hoax. For I am showing the film to be a hoax and not real. I will write more latter. BIGFOOT BOOKS: I can respond more, later. Right now I am thinking: I can't really see the things you are speaking of in the film, and that VERY WELL may be because of the fact that I don't have a good copy of the film. Those things you sent were helpful, but they are fragmentary. All I have otherwise is crappy internet versions, and some DVD ones that I can't make go frame-by-frame like you do. I PROMISE: if you send the full film (hope you have it!) done up in that same frame-by-frame-capable way, I WILL LOOK INTO IT, and will keep an open mind about your theories. Who knows? you may be right! On not. One problem, I think, is that there are such poor copies of the film floating around. A lot of what is seen on there could be flaws in the copying process, and just general degradation of the film image through time, wear and copying of copies of copies. * The part where Bob (you say Roger, John Green says Bob) is riding up the road is NOT right before the film, I mean, they had stopped the camera. When they first saw the creature, Patterson had to retrieve the camera from his saddlebag and get it rolling. * You say Bob Gimlin was filming; but then, how could he have been sitting in the bushes behind the creature? Or, if it wasn't Gimlin filming, who DID film Roger? * If you had come to the film site you'd see that the creature COULD NOT have retreated back into the woods, as behind there is a VERY STEEP canyon wall, and there is no easy way to climb that. The other way was down the creek through major wood debris and rocks. The easiest retreat WAS indeed the way it goes, to the east and upstream into the less accessible headwaters of the creek. Downstream would have headed into the areas where there were logging/construction workers. * Gimlin never said it was a hoax, he only admitted, narrowly, that it was POSSIBLE that someone, Roger or another, had hoaxed him. Only possible, not probable. Meaning only, it COULD have happened, conceivably. This is NOT some kind of admission of "guilt." LEROY BLEVINS: I am back and today I am going to send you photos and more to show my research on the P/G film. First in this e-mail I also like to show you something by looking over photos. In this e-mail and the next e-mail I will show you photos of a real Bigfoot and even photos of the real Noah's ark. Then after that I will send you photos and videos of the P/G film. 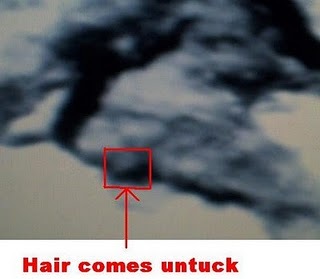 The reason I am going to show you a real photo of a Bigfoot and Noah's ark to show you my research is true. You will also see that photos and film can also tell a story. 1 day i was doing research and mapping out locations of Bigfoot accounts on Google Earth. I came across a photo on Google Earth. So as I was looking over the photo I zoom in to look at the surroundings. Then I see it yes a real Bigfoot just sitting there. It was sitting on a tree with a stick in it's hand. Now this is not a hoax this is a real photo of a real Bigfoot for the guy's that took the photo did not knew what they took. For I am the only one that knows the Bigfoot is in the photo. When you look at the photo you will see it sitting there on the tree and holding the stick in it's hand. You can see the ear the head and back you can even see the fingers and the hair stopping at the fingers. You can even see part of the leg hanging over the tree and it's in a seated potion. You will see the photo from Google Earth and the location of this Bigfoot and then you will see photos of it when I zoom in on it. Wow, now HOW did Google Earth get THIS photo? It sure looks like a stump. Years ago I have done research on Noah's ark looking for the location. As I gone over the stories of Noah and the flood. In the Bible give us a location of the Ark. So I had a friend in Canada that past away back in 2000 he had gone to Mt. Ararat 17 times. So I asked him if he had some photos of Mt. Ararat. Now the location I asked him about was the Ahora Gorge for the location told in the Bible place the ark in this location. He had 1 photo of the gorge and he send it to me. Now I had the location of the ark as told in the Bible. So when I got the photo I marked the location and zoom in and there it was locked in the rocks at 14,563ft. You can see a barge shape ark with the door on the top level. You can see the front of it and the side of it. The left side of the ark is gone. Now after I had this photo of the ark and I still did not show it for I need to find another photo of the ark to back up my claim. So in 2003 I got that other photo I need I took a satellite photo of the location. Now you can see the top of the ark and even the exposed left side of the ark. I found a latter coming down from a loft and 3 levels with rooms and cages and more. I took these photos of the side and satellite photos and got them made into a 3D to take a better look at the photos. You will also see the 3D photos as well.If you like to know more about Noah and the flood feel free to ask anytime. Like I said I am showing you these things to show that I do very good research and that I am not hoaxing no one or even show that my research I show what I claim. Here are 3 photos 1 to show there is a man behind the brush and 2 you will see the photo where the face and arm and shoulder is seen and the man has on a blue shirt. Photo 3 is a contract Patterson singed for a loan from some friends to make this movie. And Patterson has never paid them back [not shown here, but you may see it in the Greg Long book]. 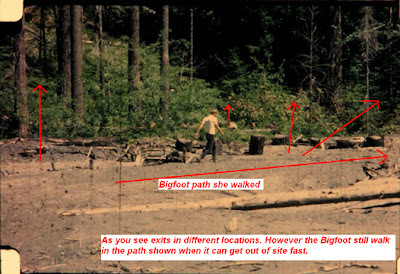 Here are some photos I like to show you on why did the Bigfoot stay out in the open when it had exits to take and get out of site fast. 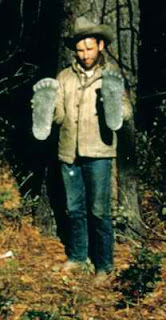 Here you will see a photo of the left foot and right foot of the Bigfoot side by side and you will see they are 2 different feet. The left foot has no toes and the right foot looks like a foot and has toes. The next photo you will see is a place I marked on as I was going over the footage in this 1 spot the fur come out and hangs there in the rest of the film. But at first the fur was under the seam and then come out and hangs there throw the rest of the footage. I am going over my clips and if I find it I will also send it to you. Now the last two photos you will see the tree patterson was by in both photos show the same tree and they both have this same carving in both photos. Now 1 photo was taken by Larry LUnd and the other photo was taken at the film site of the Bigfoot. Now you may say there are not the same tree however I match the carvings and the bark for both trees and they match you will also see this photo as well. more to come. Here are 2 photos. The first 1 you will see the copy of the suit made by Mr. Morris and a copy of the suit made by bbc you will also see photo of the costume I made and you will see my copy of the suit Patterson used are the same and the other suits made by Morris and BBC don't even come close to the suit Patterson used in the film. The other photo you will see a frames from the film to show the Bigfoot standing upright as it stopped and it did this 3 times. You will also see a frame of when the Bigfoot was even walking upright as well. Photos of the frames from the footage and part of the footage that shows the hat come in and out of frame. Here are copy's of the still frames of the men they took out of the film. The next e-mail is the clip I slow down for you so you can see it frame by frame. WOW! A ghost on the Patterson Film? Go figure. Maybe it'll be a werewolf next? BIGFOOT BOOKS: Thanks for sending that stuff. But mainly, I need to see the film copy itself, which you say you have, to ascertain anything reliable. A lot of things seen on film can be attributed to blur, distortion, optical illusion, film grain, development flaws, scratches, poor transfer and copying, and such. To see just one frame image tells little; but to see the thing present in more than one frame and potentially moving tells a lot more. I don't know what to say about that "hat." That is just strange. It does not really look like a log or a rock, but who knows? I tried emailing Larry Lund, but his address is no longer working [we have since achieved contact, and confirmation of what we'd been saying to Blevins]. I'd bet he would confirm that those photos were taken in the Yakima area, not in Bluff Creek. It is common knowledge that Roger was filming in Yakima, and that is where the cowboy images come from, and that is where Gimlin dressed as a "Indian," and that is what the loan Patterson took out was for. AFTER THAT, they went down to Bluff Creek. And if Patterson is wearing similar or the same clothes really does not prove anything. Maybe that was just his favorite shirt? Maybe he was dressing the same to have consistency of image for potential use in his film? Maybe he owned several sets of similar jeans, red checkered shirts, and wore the same jacket, boots and hat? Inference can be wrong. Just because things appear to be indicated does not mean they were/are necessarily so. That thing on the Google Earth photo you mention--it looks just like a broken off piece of wood or a stump to me. Did you notice that your image of the Ark has a "face" on the right end of it? I don't think it could be Bob Gimlin. But I will admit that the image in the PGF you point out does look like Bob; it is just that those bushes are like 30 feet plus BEHIND the creature. "Bob" would appear much smaller at that distance. Now, re. the path of the creature--I told you before, I have been to the film site. That background is not an escape route! It deadends at the base of a very steep canyon wall, one that even a sasquatch would have a very hard time climbing. The path the creature takes is the BEST one to get out of that box, and takes it up around the bend to retreats upstream or up the less steep hillside at that point to the southeast. If you could find that copy of the PGF I'd be greatly appreciative. If I can slow it to the speeds you did and watch who knows what details I will see??? Do YOU See Bob Gimlin in the Bushes? LEROY BLEVINS: one no I don't see no face by the ark and no it is not Bob Gimlin. Now Yes I have copy's of the film and yes I can slow it down to a frame by frame viewing. I have over 4000 cd's with my research on them. as soon as I find the right one I will send it. But sometime I ask my self why. And the reason for this is I seen photos of a man walking in the same path the Bigfoot walked in the film and the tree Bob Gimlin was behind you can it that the tree was no more then 10ft away from the man walking past it. But you claim it was 30ft but the photo shows around 10ft. Just like all the rest of the researchers I talk to they come up with this or that about my research and they claim I will look over it with a open mind. Then when I show what I found they claim it's this or that. 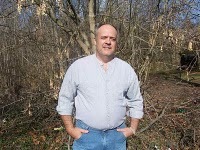 Here is 1 I like to show you you said that the tree was 30ft away from the Bigfoot that Bob G has to be a very big man. But I did some research on this if Bob was a big man as you claim then the Bigfoot was a round 20ft tall For the Bigfoot was not that much bigger then Bob Gimlin by the photo. Also I like to say if you look and I do mean look at the film and the still photos they claim they are from you will see the still photos and the film are shot at two different angles. Now I have the still frames of the Bigfoot at the same location they claim is from the film and they don't match at all for you can't even have details of the trees or anything around the Bigfoot in the film as you see in the still photo. Like the feet and the toes on the right foot. Or even Bob Gimlin behind the brush. Like the hat I show that is in the film. you can copy this film a 1000's of times over and you will still get all the details as if you are looking at the first copy. look at some of the old movies from the 1920's and 30's they still show the same details in them today same as they did when they was new. The funny thing is I show and show my research time and time again and still they make bad claims about me no matter what I show or say. Did anyone look at this why is Bob Gimlin behind the brush or why is the hat in the frames or why is there two image of men in the film. Why don't someone go and asked Bob Gimlin these thing. For I try calling him and try talking to him but he will not even say 1 word to me. But I have all of these people claiming Bob Gimlin is a nice man and he is a good man and he talks to every one But I try to talk to him and got no return from him. So this shows me the claims people tell about Bob Gimlin are not true but what can I say about it. I even gone as far as I said If Bob Gimlin will talk to me eye to eye and take a lie test and if he is telling the truth I will stop my research on the PGF and give it all to him even the suit I made. And still no return answer. put it this way if the film is real and Bob Gimlin is telling the truth then he will do this just to stop all of the people out there of the claims of it's a hoax. Even me I will take all of my research down and videos of my research on the pgf hell I will take all of my research down and stop it all together if Bob Gimlin talk to me eye to eye and take a lie test in front of a camera for the world to see I will stop my research all together then. I will tell you what you like to write some thing about me here you go. If Bob Gimlin will talk to me and Bob Heiromus talk to me all at 1 time in front of a camera and both take a lie test at the same time and if Bob Gimlin is telling the truth that it was a real Bigfoot and the film is not a hoax and that the film is 100% real I will stop my research all together and close all of my sites and videos down that no one can see it again. And I will say no more about the PG film Noah's ark or any other research I have done. Now the date is Sep 9 2009 I will give it to Oct 1 2009 for a answer. Now you like to write things and you like to stat thing about some one research without knowing the real truth about my research print this. i will give you my websites phone number and youtube site and my address so no one can say I can't get a hold of me. Now if I get no answer to all I ask for then my research is 100% true and the PGF is nothing but a hoax. So now let us see if Bob Gimlin is the man they claim him to be. For Bob Heiromus took a lie test and he past it on live TV so he have to be telling the truth now it's all up to Bob Gimlin. Let us put this film to rest. Only give my phone number and address to Bob Gimlin only do not print my phone number or address. But the websites and e-mail address you can print. But my phone number and address is for Bob Gimlin only. Bob Heironmus already have my phone number and address. 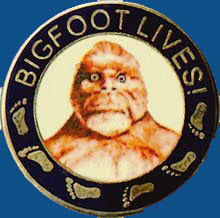 BIGFOOT BOOKS: Trust me, I would never publish your personal info unless you wanted it that way. Did you actually talk with Hieronimus??? LEROY BLEVINS: Yes I did. When I called him at first he was not home so I left my number. About a week latter he called me back. So I asked him can I ask some questions about the film. He said yes ask me anything. So I told him some of my research on the film and he told me that the part of him and Jerry Merritt was shot at Mt. St.Hellen and the photo by Larry Lund was taken 15 miles behind his house. Now at first he told me he had the time to talk and I can ask him anything. Now when I started to tell him things like the hat and Bob Gimlin behind the tree and that the tree had the same marks as the same tree in the film. Then I also told him about the image of other men taken out of the film and then he asked me about 5 time straight you seen this and I told him yes then he asked me did you show this to anyone and I told him yes and I was even on the Tom Biscardi show tell the things I found in the film. Then out of no where he said are you sure you show these thing to other people and I said yes I have and I also got a website with it on there then he said I got to go then he hanged up on me. Now at first he was very calm and cool about everything but after I told him the things I found he got very nervous and hanged up on me.Now after that happen I have a friend that knows Bob H and I call him and asked him to let me know if he hears anything for he was the ne that gave me Bob H phone number. Then about 2 weeks gone by my friend call me and told me that Bob H was going to his brother house and to Jerry Merritt house and the funny thing about that is Bob H don't talk to them that much but after I called him he was going over their house more and he also was trying to talk to Bob Gimlin as well. My friend name is Alex.So you see there is more to the story then they tell people. For Patterson when he was alive and Bob Gimlin claim there was only the 2 of them there but Bob H claim there was 3 of them there but after I told him the film show more then just the 3 men there that is when he got nervous for you can hear it in his voice. BIGFOOT BOOKS: Don't take it personally. I'm just giving you what I know to be the commonly accepted facts. I may be wrong, who knows? But, the film site WAS measured, and the diagrams show a much greater distance than you claim. They were there on the ground, shortly after the film was shot. I was there too, and there just isn't an escape route where you think there is one. What is better evidence, a grainy old film copied who knows how many times, or actual observations on the ground at the site? I'll try to find you a copy of those diagrams. I don't know what you are seeing IN CONTEXT, though, and can't freeze frames in the copies of the film I have. To say something is really more than just a momentary blur it has to be repeated over several frames. How many frames can you see the "Gimlin face"? I don't know Gimlin personally, having only briefly met him at BF events and such, so I cannot guarantee your challenge will ever reach him. I did forward it to someone who could get it to him, though. Gimlin may not want to talk to you because you're basically calling him a liar. I can tell you, he's tired of hearing that. Put yourself in his position--how would you feel? Heionimus' story has changed in dozens of ways. I don't know how he could pass a lie test, save if he is just very confused. Also, you might ask him about the hat and other "men" in the film---he said there were only the three of them there. I do wonder, what IS it that that motivates you so against the film, and to come down so hard on Gimlin? LEROY BLEVINS: That is what I am talking about in the film you can see Bob Gimlin in the film. But you can see him in this 1 photo. But as I put this 1 photo to the frame from the film they did not match. For the film you can not make that much details out even the tree you can not see clear but this 1 photo they claim is from the film show a lot of good details in it and more clear. And the angle of the 1 photo and the angle in the film are two different angles. So my point is the 1 photo of the Bigfoot walking by the bush where Bob Gimlin is was taken with a different camera and different angle. And the film was shot with the 16mm camera 100ft away at another angle. Just like the photo show the Bigfoot closer to the tree and the bush but the film shows the Bigfoot not even close to the tree or bush. And my point on this is the 1 photo they show the Bigfoot walking past the brush is not from the film and that the photo was taken with a different camera. This is why you see Bob Gimlin standing behind the tree. For you see I looked over laws and if Patterson and Gimlin got busted in a hoax they can claim it was a movie this is why they left the things I found in the film and photos to cover them if they did get busted. Then they can claim yes it was a hoax we said it was real but as you see Bob Gilmin is in the photo with the Bigfoot not far from him and you can see the hat they left in and the images of other men. So you see they had them self covered both ways you can claim it is real but if you leave something in there that also show it a hoax then they can't be held for anything. Just like that Big Bigfoot hoax last year. They claim it was real but when it came to the truth they claim you can tell it was a hoax for we changed the stories and show different things to show it was a hoax. Even in the stories Bob Gimlin tells he also changed his stories and 1 time even said it may have been a hoax. And with him doing this is covers him if the truth ever comes out. So my point is b y law if they show something in the film or photo that shows it was a hoax then they can not be held for it. But if they took every thing out and did not post the 1 photo where Bob Gimlin was behind the brush and did not show the part with the hat and the images of other men then they can be held for it if they got busted. But with them posting these thing and just speed up the film where people can see it then they can not be held for the hoax. Even if Bob Gimlin told a family member or a friend that it was a hoax that also covers him. This is why Bob Gimlin took Miss Patterson to court for the rights to the film but soon after that he sold it back to her for $26.00. Now what is the reason for that spend more money to take her to court for rights to the film and then sold it back to her for $26.00. This shows there something not right here. Now what I just told you is found in the court files in Washington. To me I don't care if the film was real or a hoax I am only doing this is to bring out the truth and show what is in the film and photos. Now if people don't believe me that is ok with me and if people can't see what I show them they are not looking at it with a open mind. Just like the hat in the film. why would anyone put a hat in the film there is no reason for that so this part of the film is real for the hat is there and only in two frames. 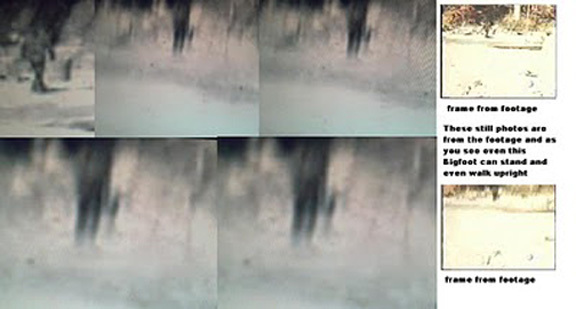 Like bob Gimlin why did someone put the face of Bob Gimlin behind this brush there again is no reason for this for people is claiming the film is real but here are these images in the film and photos. I also like to say before I even claim it was Bob Gimlin behind the brush I match the face to Patterson and Merritt and even Bob H before I even match Bob Gimlin to the face and Bob Gimlin face was the only 1 that match 99.99% and this was done by me and another photographer. Like I said I also have other researchers and photographer look over my research before I make any claims. However they will not be name for they don't like no part in it for they know how people a re when it come to this film. BIGFOOT BOOKS: Wow, what a mystery! There is definitely something strange going on there. I mean, if he passed the lie detector, why would he get all nervous and hang up on you? Not only rude, but suspicious. 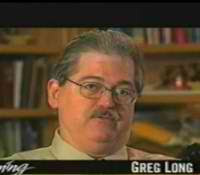 Have you read the Greg Long book? I disagree with much of it, or find much in it to be contradictory; but it still contains some of the best biographical information on Patterson and the filmmaking, plus great interviews with the Yakima set. What do you think of it? Is it accurate? Look, I really tend to believe the film is real, BUT I'd agree there is a lot in the story that does not fully make sense. Like the stated timeline after the film was shot. It took me nearly two hours to drive over Bald Hills Road, meaning the trip from the filmsite to Eureka to mail it had to take at least three hours. Then another hour back to Willow Creek---HOW could they have gotten onto WCK by 6:00 or so? Just not possible! In my opinion.... But that is just Al Hodgson's story of the events. Bob Gimlin always says they went directly to Willow Creek to see Al first. The Author of "The Making of Bigfoot"
LEROY BLEVINS: Yes I read his book. But even in his book there was questions still un-answered. Like even Mr. Morris he sold Patterson a gorilla costume that means the face and hands and feet was like a gorilla not like a Bigfoot. For even back then no one can make a suit like a Bigfoot for no one has ever done a suit like that. However Patterson was the first one to make a suit like a Bigfoot. And the time line as told Like I said I called the place that was told that developed the film and they told me yes they can develop the film on a Saturday but they closed at 12pm on Saturday. However they said they can only do 1 reel of film not 3 but it was told they developed all 3 reels on that day. Just like when I was taking frames from the film and place them on photos of the location as I was matching the frame with the location some of the frames was in different spots at the site. If I find my research on that I will send it to you. I like to also tell you something I have also seen by researching the film and photos. If you look at the film you can see Patterson face clean shave at the beginning But when they show Patterson at the end of the film he had a little beard going on there. Now I don't know about you but the beginning of the film had to been shot at lest 4 days before the last part of the film and even when Patterson was making the prints he was clean shave. But it was told it was all done the same day. The last part of the film you can see as Patterson was making the prints he was clean shave and then by a tree with the cast in his hands he looked like he did not shave for at lest 4 days. But at the beginning of the film you can see Patterson riding to the camera and he was clean shave. So you see the film can tell a lot if some one points out these things. I will send you photos of what I am talking about. BIGFOOT BOOKS: Well, I have been wondering all along why you thought they would have guys standing around if they really wanted to fool people. I guess that "legal out" is your explanation, then? Because otherwise why not stand around off-camera? It sounds like a conspiracy theory to me! 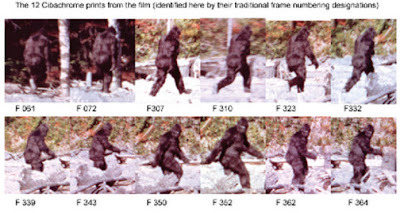 So you are saying that the Gimlin face is in the still photos, but NOT in the movie? Film expert Bill Munns says it was a 15mm lens, and that puts creature height at 7 foot 4 inches. And why would Hieronimus lie or cover up stuff? If he was there he was only an "actor," no? And he never got paid. I have never tried to compare stills to the movie--they always looked the same to me. Before MK Davis' work stabilizing it there had not really been a good non-video-tape version out there. And what do you think of MKD's Bluff Creek  "Bleep" Theory? LEROY BLEVINS: MK Davis: Here is where I think he even knows something he is not telling people. It is told he is the only man that seen the original film that Miss Patterson has. At first MK was telling people it was real and he is to be the best researcher on the film. Now he did work on this film for over 11 years showing this or that is what the film show as he claims. He added the mouth opening for you can see that it was added in. And even other things he add in. Now think about this 1 after I did my research on the film and making claim and show my claims of another man hat and there was other men there and the Bob Gimlin behinds the brush and that there was other camera used at the film site. Now MK is saying there was other people there and claims there was more then 1 camera used. Same as some of my claims. Now he is coming out with this Big [The Theory Formerly Known as...BLEEP!] just to keep people thinking the film is real. Like he shows people a bloody paw print in the PG film sorry I gone over the film as well and I don't see it even when I look over it frame by frame. That was added in by MK Davis. Then he saying this dog has blood on it and a man had blood on his hands. Now I like to point out something that is so funny about this. I came out last Oct on my research on the PG film. And every body seen MK Davis work on the film for years and he show all the same thing nothing new just the same thing. Now in Match of this year I was listening to a radio show with MK Davis was on and someone called in with a question to MK and said the was a man that claim he found a hat and other men in the film. MK said he needs to take a look at that. Then he said I will go over it and get back to you. Then 2 weeks after that MK started to put new videos on his youtube account with new research on other men there and other things. Then I stared to put new videos on my account on the film then MK was adding new videos every two days. Now MK did not add videos like this before until after my claims. Now MK took off all of his accounts on youtube and a lot of website as well. And now MK Davis is calling the PG Film the PGT film. And he is claiming other men there and they used other camera at the film site. So you see there is a lot of truth to my research for even MK Davis is now changing his story and research. So you see my research is stirring up something that only the people that works on the film and people surrounding the film is come up with new stories. Go look at some of the new things MK Davis is telling about the film. Now he is 1 I like for you to think about MK Davis gone over this film for over 11 years like I said well I even asked MK Davis and send him a e-mail and even left a comment on his youtube account and even e-mail him on his youtube account about my research and what I am showing on the film. And I asked him to go over my research and videos on what I found and even try to prove some of my research wrong and you know I have not got no answers back from him and he will not even talk to me about it or even say my name. Now if what I found is not there then why can MK Davis talk to me about my research. I even send him my phone number 7 times. and not even a phone call. Now what doe's that tell you. MK Davis is in it with them and this is why he is the only one that can see the film of Miss Patterson and no other research can. And this also shows that I am very close to showing the hoax that they are trying new stuff to keep people thinking the film is real when all it was is a hoax. Think about it started to go over some of the new things MK is talking about. Like other people there and other cameras used. You will see my claims on these thing was done before MK Davis claims. from During the Blue Creek Mountain Trackway Investigation. BIGFOOT BOOKS: I had a phone call from MK one morning that went on for like three hours. I found him to be a gentlemanly character, with some interesting ideas. But as I listened his ideas became more and more strange. He sent me pictures of things like all that "blood" and "gore," things that were obviously not true, and that were based on a film made on the trip John Green and Rene Dahinden made to investigate footprint finds BEFORE Patterson and Gimlin made their film. IN FACT, it was this investigation that alerted P and G to go down to that area in the first place. HENCE, the ["BLEEP"] did not ever happen. It is a fantasy of Mr. Davis, only, and nothing more. I don't know why he is spreading this nonsense around, frankly, it is total nonsense. Perhaps he is just trying to stay ahead of your research, and grab all of the attention, as you say. The thing is, that attention has been almost totally negative. Especially as his sources have been proven to not be what he claims they are. John Green was there when the film with the dog was made, and he has refuted MK's claims. Mrs. Patterson has let many researchers whom she trusts view her film copies. I know personally several of them who have watched the films in her house. So, go figure, I guess. MY sources state, I mean people like Jeff Meldrum, that the image of the semi-bearded Roger Patterson was taken AFTER the filming, back in Yakima. He grew that facial hair after the event, so there is no contradiction. There is talk of a "reenactment" (or something before Bluff Creek) that he did of the footprint casting scene, so that may not even be a legitimate part of Reel Two. The same tree theory you have might explain this. They were filming near where Patterson was living, out to the west of Yakima proper. He made the film with all those guys on the horses BEFORE going to Bluff Creek, then returned to Yakima and posed before the tree. Perhaps? I think it was taken in Bluff Creek, anyway, but the casting scene may not have been. 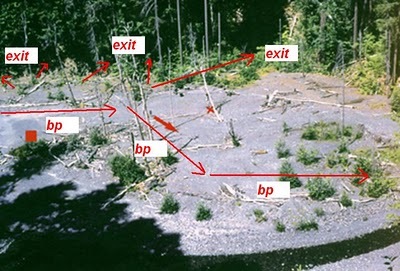 Other researchers claim that photo with the footprints was taken at Bluff Creek, but the beardedness kind of disproves that if the footprint casting scene was taken the same day. Re. the "same clothes" theory... Well I wear similar clothes all the time. Boots, jeans, a hat, all could look exactly the same. Me, I have about four gray longsleeve t-shirts. Take a picture of me Monday, Friday, Sunday, I might have the same shirt, or one that looks the same, on for each day. It proves NOTHING. The more photos you send the merrier. I am appreciating investigating these mysteries with you. LEROY BLEVINS: Yes I see what you are saying but you see I look at this. MK Davis is the man that tells people the PG film is real and he was the one that points out the muscle movements and other things like that. But now he is adding more thing in the PG film like the bloody paw print and the glow of someone on the hill and the blood on the Bigfoot hands and even on the tree. And he even place Patterson standing by the tree with the prints in his hands at the film site and he even shows this in a report he did showing this 1 photo of Patterson holding the prints in his hands by the tree we are talking about and shows a photo of bluff creek and place that photo over the other photo and said here is the tree Patterson was standing by. So my point is MK Davis adds things to the film what make me think was he doing this all a long adding the muscle movements and the mouth open and more. I will send you two photos he has on that report to show you were he is claiming where Patterson was standing with the prints in his hands. I made the photo just like he shows in this report if I can remember were the report was I will send it to you. But like I said with what MK Davis is talking about how can you believe in any of the research that he done on the film when he come out with all that he is claiming now. as you look at the photo you will see were I place Patterson with the prints this is where MK Davis said it was taken at. And then he also has a photo of just the tree pointing like I also show in the photo you will see. Now I match this to the tree with all 6 men and even Bob H told me it was taken behind his house 15 miles back. But MK Davis claims the tree you are about to see in the location photo is the tree Patterson was by. Now as you see I don't have to try no more on telling people the Film was a hoax for MK Davis is coming out with all of this new stuff soon people will just look at all of his work and say MK Davis hoax people in trying to make the film real when he adds things to the film that are not there. Then all of his research on the film will just be a wast of time. Image from John Green's Film of Jim McClarin, with Patterson Superimposed. today I did a test on what you told me and by this test the Bigfoot was closer then you told me and even others. First in a e-mail you told me that can't be Bob Gimlin behind the brush for the Bigfoot in this 1 photo the Bigfoot was about 30 feet away from the trees and that means Bob Gimlin had to be a very big man. 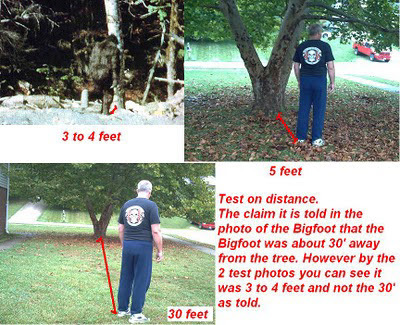 Will I test this and took some photos of me 5 feet away from a tree and then 30 feet away from the tree and by this test you will see that the Bigfoot in the photo is closer then you said and even what was told by others. So you see my new website I am going to put everything to the test. For you see like you told me about the Bigfoot and the brush you said the Bigfoot was 30 feet away for this was measured by someone and they said it was 30 ft well I did a test on this and sorry to say but by doing this you can see the Bigfoot was 3 to 4 ft away and not the 30ft away. Now I know that you been to Bluff Creek and yes I have not but no matter where you are you can clearly see by analyzing photos and even doing test on your analyzing to find the truth you can find things that stand out to prove the work you have done. Like in this 1 test photo that you will see with this e-mail. For like I said people can tell all the stories they like and just tell a little of the truth in their stories but in my new site I am going to point out and test everything to show my point. I am taking all the comment people had made and stories and film and photos and I am going to test everything and post my finding as well. I like to thank you and feel free to ask me anything about my site and I will answer anything you like. Here are two interviews done 1 in Nov 1967 with Roger Patterson and Bob Gimlin and the other 1 is the one you send me of John Green interviewing Bob Gimlin. Now as you read just these two interviews you will see there is a big change in the stories they tell. Like Patterson claim his horse fell on him but the interview with just Bob Gimlin he said no the horse did not fall on him. But my point on this is why did Bob say something when they interview both of them in the first interview. 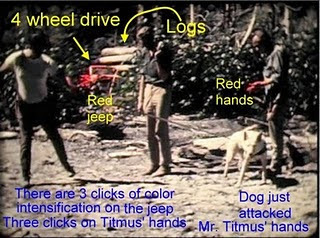 Now Patterson said that Bob when it came to the hands for Gimlin claim the hands was below the knees but Patterson said they was above the knees. Then in that interview with Bob Gimlin he also said the reason they did not have much film was Roger was taking photos and filming him and the woods. Now 1 thing I like to point out by this is in other words Bob Gimlin was telling that Roger Patterson was doing the filming but the film shows Roger Patterson in front of the camera now how was doing the filming if Bob Gimlin was did not have the camera. And another thing as you look at the film like I said you only see Roger Patterson with the pack horse not Bob Gimlin for you can see it was Patterson by the clothes he had on and even by the horse we was on they are the same. Now even Bob Gimlin claim the Bigfoot was walking upright and standing upright. Now I also like to point out another thing that you send me the Munns report did you look at the photos on that site the first 1 is the same still shot I have been showing before this report came out. Now as you look at it you can see the image of the man on the right this is the image of the man they took out of the film. Now I even like to point out one thing that Mr. Munns over looked and this is you know the part of the film in the beginning that shows Roger Patterson with the pack horse in the woods and then it goes into Roger Patterson on the road with the pack horse. Will look at the surroundings in the beginning and then look at the site you send me showing still of the bigfoot walk off into the woods. For the part that shows Roger Patterson riding with the pack horse in the woods and the part were the Bigfoot is walking into the woods well they are the same locations. Yes the part of Roger with the pack horse in the beginning of the film is also the same location were the Bigfoot was walking away into the woods. but at different angles. take a look they are the same. Now the photo of the location you send me did you look at the count in the numbers they are not in order. So my point in all of this is every time I show my point people comes back with somethi ng else Like the photo I send you now let me get this right the tree is close to the Bigfoot but the brush is farther back from the tree. 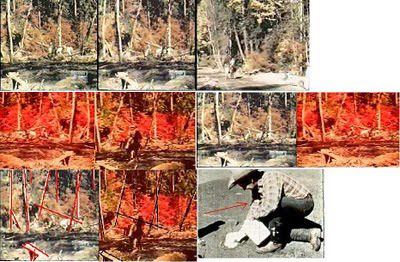 if this is what you are saying but by the photo the photo and even by the film the brush is just behind the tree about 1ft Now this makes Bob Gimlin standing just 4 to 5ft away from the Bigfoot. Now I show my point now I like for you to show me that this 1 tree is far from the brush for the photo you send me is not even showing this location on it for I looked over the surroundings looking for this spot in the photo you send me that the tree and brush in not even found on it. BIGFOOT BOOKS: The Munns Report: http://www.themunnsreport.com/ A thorough analysis of the dimensions of the creature, etc. The dimensions of the site: http://www.themunnsreport.com/tmr_site_024.htm Here showing the central area of the film. Notice the orange trackway of the creature is FAR from the backing trees! Here is the best image I could find so far of the film site measurements. It is hard to read the John Green one on the left, but you can see it is 116 feet to the "big tree" behind the creature's path. In the Dahinden one it is 75 feet or so to the preceding trees. These diagrams fit in the middle of the film site image I sent you before, where the creature walked along the numbered pathway. LEROY BLEVINS: In all the photos you send me and drawing still don't show the same location where the Bigfoot was by the tree and Bob Gimlin behind the brush. I gone over the photos and analyze them looking for the same shape in the trees but still the location I am talking about is not found in any of the still photos of the location. BIGFOOT BOOKS: The only way to prove that there is a shape in the trees, or men standing around like ghosts, I think, is that you have to show that they persist over many frames like a real object. The "hat" you speak of, for instance, is only there for a fraction of a second. It moves in and out of the camera lens so quickly that it simply could not have been a real hat on a real human head. No one can move that quickly. The "Gimlin" seems to be there only on one frame. It is there before and after the frame you use? That is why I want to see the frame-by-frame film you are using. I'd really like to see what you're talking about in that perspective. One frame proves nothing, ESPECIALLY in the blurry, moving, distorted early part of the film. They don't show the EXACT location. I am trying to find images that show you the perspectives WITHIN THE FILM SITE, but few are available. Your area is just to the left of the images I can find, as everyone focuses on the part of the film where the creature is most visible. They documented a lot, but not every single spot in the whole area. I can't go back in time and get you a picture of the exact spot. The measurements apply, though, if you look at the trackway of the creature. It did NOT get that close to the background trees and foliage where you say Gimlin is hiding. The creature does not approach the forest edge and then retreat back into the sandbar. It moves away from the creek toward the forest, all the while veering to the right to get past the sandbar and into the creek area where it could escape. You are looking at optical illusions, again, I have to say! The facts were right there on the ground, but don't show up so clearly in the film. You should talk to a film/optics expert like Bill Munns. You'd see how wrong a lot of your theories are. Like the arms thing: so what if they saw things a little differently? That is NORMAL when two people report on something they saw. Patterson and Gimlin are two different guys. They saw the creature only briefly. In the shock of the moment how could their stories be exactly the same? Ask any police investigator: eyewitness testimonies vary greatly, and are highly subjective. Re. the earlier footage, before the film: You KEEP saying that it was all taken in one time, but the shots of the guys on their horses were shot in fragments, BEFORE the film of the Bigfoot, not in one long run. Sometimes Roger filmed Bob, sometimes Bob filmed Roger. The guys took turns with the pack horse, and John Green has confirmed that the first images are of Roger, the one along the road is of Bob. He knew these guys. The film is NOT clear enough to say what clothes they are wearing. BUT, both dressed essentially the same--they were cowboy types, wearing cowboy outfits. You might want to take a logic class, my friend. Your "explanations" are more convoluted and strange, requiring much more proof, than the relatively more simple explanations given by the two guys who were there that day. Just because you can find a few contradictions in their stories does NOT mean they were lying. If you think there are men in the film, that blurs and film blobs and shadows are actually people, then I would REALLY like to see you submit your findings to a film expert for analysis. You will be proven wrong--the film has already been evaluated by film experts and shown to be free of tampering. PLUS, you do not have an original of the film, so any weird things you see in there may be flaws in the copy. Or copies of copies of copies, from television, which you then copied from, of all places, YouTube! LEROY BLEVINS: 1 I do know that P and G are two different people. But you still you don't understand nothing do you. You talk about Mr.Munns being very good at what he did on the film but why can't he see the image of the man they took out. For even 1 of the frames he shows in his report is also the same frame I shown over a year ago that shows the image of a man walking off to the right. And the part of Bob Gimlin going down the road with the pack horse sorry again my friend on that one for that is also Roger Patterson For you see not only did I look over the clothes they had on but if you seen the film you can see that even the horse that Patterson was on is also the same horse that Patterson was on going down the road. Look for even Bob Gimlin said that Patterson used a smaller horse then he did for Patterson horse in the beginning of the film is the same horse you see going down the road. Now are you telling me they also change horses as well. This is 1 thing I am talking about people looks at other people claim on this film like MK Davis and this MR. Munns but no one looks at my research on this film and you know why is they claim the Bigfoot in the film is real as for me I claim it was a hoax this is the reason why no one will look at my research or the things I point out. Now I have not talk to John Green and I have not talk to Bob Gimlin even I did try to talk to Bob Gimlin to ask his some questions about my findings. But still know luck. You know let me tell you a little about what I believe in some of the stories they tell. First like Mr. Morris he claims he sold Roger Patterson a Gorilla suit now do I believe this yes to a point. The reason is a Gorilla suit does not have human like feet and the face is a Gorilla not human. But this does not mean that he did not sell Patterson a suit. Patterson is the one that made the suit and he just used the fur from the suit he got from Mr. Morris for Mr. Morris sold him a Gorilla suit not a Bigfoot suit for they did not make them back in 1967. 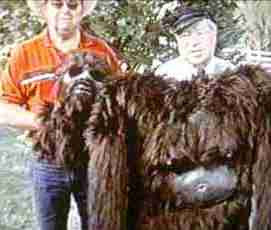 However Patterson was the first one to make a Bigfoot costume. Now about Bob Heironimus was he the man in the suit Yes and why I make this claim and my proof. The Bigfoot in the film walks this 1 way it pushes off with it's right foot. The same way Bob H does. The feet of the Bigfoot the left foot goes in a up and down motion but the right foot goes in a angle and veers off to the right that same as Bob H. Now by looking at this the leg motion and the feet motion and the arm motion match that of Bob H and sorry to say but to people do not walk the same way but the Bigfoot in the film and Bob H is 1 in the same. Now Bob H also took a lie test and past it that puts him in the suit but the whole story he tells is not all true for you see he claims there was just the 3 of them there Him being Bob H and the Patterson and Gimlin. But I claim there was other men found in the film more then 3 and I also talk to Bob H on the pho ne and told him of my finding and he got nervous on the phone then he had to go.So you see even in the stories told by Mr. Morris and Bob H I think there add more to it as well. So my point is these people only telling things they like people to believe with nothing to back up what they tell. Like I said before why keep asking me all the question about that day when 1 I was not there and 2 if you like to find out if I am telling the truth go ask people like Bob Gimlin and show him what I found and ask him about it like him behind the brush or the image of other man taken out of the film and even the hat. If this man is like people claim he is then ask him not me. But I do say this if some one shows Bob Gimlin my findings in the film I do know he will get very nervous about it. Even he may not say nothing and just walk away if someone show him my research on the film. Ok as I was going over the film like I said frame by frame this is what I found. The Hat first you see in one frame the bream of the hat the next frame nothing and then the next frame after that the whole hat. But in some frames before and even after you can see in blurry marks like they took it out. Not the image of the man with the shadow you can see the image of the man and his shadow in 7 frames. The image of the man walking off to the right in the film you can see this image of this man walking off to the right I think it was about 10 to 12 frames of this. I will be showing these thing in my new website. The PGF Cibachrome Prints. CLICK TO ENLARGE. HOW FAST DOES THAT MEAN "THE HAT" WAS MOVING? HOW IN THE WORLD DO YOU PROPOSE THAT THEY "REMOVED" THESE "MEN" FROM THE FILM? The hat moves too fast to be a hat. The men are just blurs, from what I can see. Can you prove not that the blurs look like men, but that they ARE in fact men? Many an ambiguous form can LOOK like a man, or a face, or a demon, or a Gimlin; but the mind is designed to find these familiar forms in abstract backgrounds. We seek order and form, even when there is none. We see things that are not really there. It takes great evidence to PROVE that they are there, that is, if they are not clearly obvious. I understand NOTHING, you say? Hmmm. No. It is that I do not agree with what you are saying, or it has not in any case been proven to me yet by you. Where is your backing evidence, where the source quotes, where the verification? 1) Munns may have seen the "image of the man," but thought it to be nothing but an inconsequential blur that coincidentally might happen to kind of LOOK like a man (to you). That does not mean anything is actually there. 2) Gimlin on the road: well, who knows? Maybe John Green was wrong? But to me the image is way too vague, distant and faded to really tell who that is on the horse. And what would it matter? They both filmed each other along the way, here and there, trading off the camera and yes, maybe horses, too. If you take your "hat" idea away it makes no difference, as that film was not shot right before the creature was seen. It was shot earlier. The camera was IN THE SADDLEBAG when they saw the creature, and Patterson had to dig it out. Anyway, the shirt on the guy riding the horse looks blue to me, and that would mean it was Gimlin. Roger was wearing a red checkered shirt that day, and I just don't see red in there at all. 3) Actually, there are conflicting stories as to which horses they were using on that particular trip. Patterson had two small ponies, but it is not clear as to whether he brought one of those or borrowed another for the film trip. 4) Patterson bought a gorilla suit? Well, yes, there are indications that he did, for the FILMING IN YAKIMA, for a dramatic re-enactment, like they do on MonsterQuest or whatever other documentary. 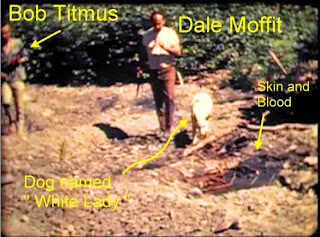 Patterson was making a docu-drama, but then filmed what appears to be a real one on Bluff Creek (or maybe it isn't real, if you insist); but that Morris suit fur is totally different from what is in the PGF bigfoot footage. 5) IF Heironimus is telling the truth, then why does he LIE about the number of men there??? It doesn't make sense. It is in his story that there were only three, so he is lying, if only by omission. But then, maybe the lie detector test was not properly done, or asked the wrong questions? LIE DETECTORS ARE NOT CONSIDERED RELIABLE EVIDENCE, anyway, in court or elsewhere. They are simply interpretive process that kind of approximate to the truth or lies in a given case, or display how a person feels when talking about something. Besides, Patterson is said to have taken a polygraph test at the behest of National Wildlife, and he PASSED it. 6) Gimlin would not want to talk to you, I am positive of this, as he is simply SICK TO DEATH of these kind of questions. 7) Your "evidence," I am convinced, would be thrown (laughed) out of court if this were somehow brought "to trial." It is interesting, but it is NOT PROOF of anything. It is way too inconclusive, and you make suppositions about stuff that may or may not be true. It is not proven just because you see some ghost image in the film. One cannot make firm conclusions on such bases. You need to show a chain of events, with motive and evidence along the way, not just some blurry line that may kind of look like a watch on an arm. Not a blurry tree branch and log, which can clearly be seen before and after the "man" you think it is "emerges" into form. You know what I mean? I understand perfectly well. But I have not seen anything in your research that would CONVINCE ME, however interesting your theories are. Look at the JFK Zapruder film. There are blurs up on the grassy knoll that some think are men, the other shooters. BUT, when you zoom in there are just the vaguest blobs, and these could be leaves, shadows, or whatever. There is some evidence that there were shots coming from the area of the knoll, BUT the film provides no conclusive proof of that! See? SHOW ME REAL PROOF before you make outrageous claims. Your explanations don't simplify or clarify anything in the film; they just make further mystifaction and add up, basically, to conspiracy theories. I WILL SLOW IT DOWN TO FRAME BY FRAME, AND I WILL I PROMISE LOOK VERY CLOSELY AT THE AREAS YOU ARE SPEAKING OF, AND I WILL KEEP AN OPEN MIND TO SEE IF MAYBE, THEN, YOU ARE RIGHT AFTER ALL. Right now I just can't say I'm convinced. Nothing personal, though, you know? Gimlin was wearing long sleeve blue shirt that day. However I had this photo for about 11 month now. Do you think I give out all of my information up front? I show you and even others just some of my research for if I show it all up front that gives others to come up with more stories to tell like MK Davis. After I came out with some of my research about they used more then 1 camera and that other men was there now MK Davis is talking about they used other cameras and that there was more men there that day. He has gone to start telling a stories that there was a blood bath there. Just to keep this film alive and try to have people still believe the film is real. But as you see people now think he is crazy or nuts on some of the new things he is telling. But when he first did his research on this film he was all that when it came to this film but now these same people are calling him these things. So you see The more I show people still will not believe me all they can do is just keep asking questions but the true fact is for example: If that is not Bob Gimlin behind the brush then why don't Bob Gimlin give the answer not me. Then ask him why are there images of other men in the footage that was taken out of the film. 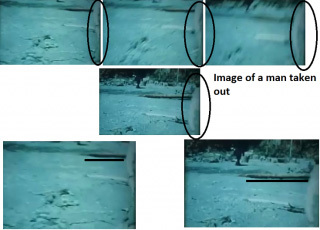 By the way I will let you in on this 1 the image of the man they took out but left his shadow in well these 5 frames was that of Bob Gimlin. They took his image out of the film for this is the same location where Bob Gimlin was behind the brush. 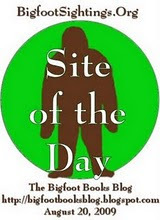 BIGFOOT BOOKS: Watch the film here, at about 6:50 in the clip. You can see in the part where he is riding up the road at 7:40 in the clip, BOB has a BLUISH shirt on! It is not red checkered. You will also see John Green showing the actual REAL film reel. Also, you might note that the pack horse appears smaller, the whitish one--this appears to be the pony Patterson owned! And Roger was riding the bigger brown horse in the earlier part with the red maples in back. But you did not answer my questions. How could Gimlin be in TWO places? Behind a bush, in the foreground, what? It is clear that there is NO HAT in that footage of him riding up the road, wearing his blue shirt. It is so obvious in that YouTube link I sent you. At normal speed, the speed at which actual real humans can move, there is NO HAT. There is a strange irregularity of the film in the lower corner, that is all. LOOK AT IT AGAIN. No hat, blue shirt; it is Gimlin not Patterson. I told you, Bob has better things to do that sit around and be accused of hoaxing and lying. What would you do in his position? After decades of this, you'd probably not want to talk about that kind of thing either. MK it seems is playing a strange kind of publicity game. In any case, I would not want to be seen as the source for his ideas about the film if I were you. He seems to be a good guy, but his ideas about what he sees in the film and its history are pretty strange. LOOK, I AM LISTENING TO YOU, aren't I? I am willing to be proven wrong--if there is PROOF. "The camera was IN THE SADDLEBAG when they saw the creature, and Patterson had to dig it out"
BIGFOOT BOOKS: Well, the suit seems to have been in Hieronimus' trunk, and who knows where it ended up. But that was the suit Bob H. wore in Yakima. On a short film reel they didn't have time to film everything, obviously. He was trying to get general clips of the area for use in a film as stock footage, scene setting, etc. How could they "Show This" switching of the camera? They would film, turn it off, put it back on later. It is clear in the stories told by the guys that Patterson left one of the two clasps of the bag open for easier retrieval, and had practiced grabbing the camera out, for just such an occasion. It could be done. You don't KNOW that it was not, and besides, as you said, you were NOT THERE that day! LEROY BLEVINS: First I like to thank you for that site. For you see I gone over that video and it shows the same thing I have point out. Me and my wife just got done looking over it and I stop it in the spots where I found the hat and the images of other men they took out and this is also see in his copy of the film. So you see these things are in the film. Even as you look at the beginning were you see Patterson in this open space will did you no that is the same location they film the Bigfoot at. For I did not knew this until now for that was the first time I seen this part of the film. Now here is something I can also point out that Patterson was in the same location in the beginning before they seen the Bigfoot. BIGFOOT BOOKS: I don't see that 'hat' AT ALL! Only when it is slowed down to the point that it exceeds human movement speeds can it be seen, and then it is only the briefest of blips. And the "men" watch it at full speed. They are just the most fleeting blurs. The camera is bouncing ALL OVER the place at that point. Nothing but the most obvious rocks or logs can really be identified until it stabilizes. And in the McClarin reenactment--he is WAY back off from the canyon wall/forest behind. Test it out. Your Gimlin-in-the-bushes is a GIANT! I recall seeing something you did comparing the trees behind Patterson, but don't know where to find it again. That would be odd if they rode through the same spot over and over--why would a bigfoot stick around if that were so? Anyway, we just don't know all the details, and shouldn't just go guessing and filling in blanks with suppositions and no evidence. LEROY BLEVINS: Ok what I am trying to say here is you made a very good point why would the Bigfoot stay around in this same location when other men are there. Look at this a Bigfoot staying out in the open like it did and then you have a man running at it with a camera in his hands and another man on a horse. Now look at this you have two men on horses and you know they have to be making noses will here you have a Bigfoot did not hear these men or horse and this bigfoot did not even smell them coming. Now think about this one which way did the Bigfoot came from to get to that location for you see they only found and show the prints of the Bigfoot exiting into the woods but there was no entering footprints. Do you see what I am saying at this point. Where is the location where the Bigfoot started from for like I said you see the foot prints of where the Bigfoot started to walk but where is the prints of the direction it came from? You only have the exiting prints but no entering prints. For like you told me when I said the Bigfoot can exit here or there but you said you can't exit in those places. So the Bigfoot had to come from the direction it left in. But the prints was only going 1 way. So the Bigfoot had to come from the woods so why did the Bigfoot gone back to where it came from to get out of site. Then look at this why did this Bigfoot just walked away when the Bigfoot should have run away for you have 1 man running at it with something in his hands then you have this other man coming up behind it and having a gun in his hand. This alone tells you something is not right. Just like the story Bob Gimlin told he got up before Patterson and left the camp site and when he came back Patterson was gone and then Patterson came back then Bob said let us go over here but Patterson said no we are going over here where Patterson was at that morning. Then both of them gone to where Patterson was first at then they seen this Bigfoot. Even that tells something is not right. So you see it is hard to go on what story they tell so the only way you can find the truth is just go on what the film shows. Now I have asked other that know Miss Patterson if she mind if I look over the film or she can make a copy for me to look over just to see it more better and I like to look over the whole films they shot that day but they said no she will not let no one look at it until she is gone then they can look over the whole films and other things she has in this trunk. Now what I don't under stand is what can be so big to have a trunk for film is not that Bigfoot and you can place it in a box but I was told it is a very Big trunk. But again that is what is told.Now if I had the money I love to go to Bluff Creek to look over the site for my self for what I seen of the location they was telling is the location does not look nothing like the location in the film. 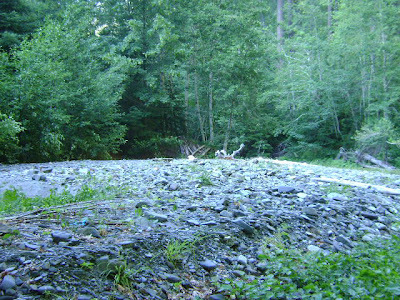 For Bluff Creek you see a lot of rocks all over the ground but what you see in the film the ground is very sandy. BIGFOOT BOOKS: There IS still sand, and a sand bar, but trees and shrubs have grown up in it. The creature could have come up to the site through the creekbed and surrounding woods. I can't recall where I read it, but Bob Titmus found a backtrail from downstream. LEROY BLEVINS: Funny you said Bob Titmus found a back trail, I say this is MK Davis is claiming Bob Titmus was there with Patterson and Gimlin. This is why today MK Davis call the film the PGT film. For he said they used two different cameras Patterson was filming with 1 and Bob Titmus was filming with the other 1. For he said as he was looking over the copy's of the films they was too different type of film used. Now there is 1 thing I like to say about this you know I the claims I made and now the claims MK Davis made about other people there and the use of two cameras instead of people started to make all these bad comments and claims about my research and even MK Davis research why don't they stop first and take a long look at it. For now you have to look at this as well here you have 1 man backing this film for years then you have this other man that believes in Bigfoot but not the pg film and these two men don't even no one another and don't even talk to one another but come up with some of the same thing. So do you see what I am talking about here. I try to contact MK Davis and I even send him some of my research and photos to show him but he never call me or send a letter back to me. Just like all the others that did research on the film I e-mailed them and even wrote letters to them and send them some of my research on some of the claims but no one calls me or e-mails me or even write to me back on any of my research or claims. But the people that I send e-mails to or letters to they write me back or e-mail me with there answers but these people are people that just go over my research and the other people research on the film but the people that did the research on the film never comment me back on anything. Now why is this have they seen the same things I point out and they don't have the answers why these things are in the film how knows. But my point here is if none of my research or claims are not as true as they tell it then why don't these people write me back. I know why they don't is they have seen the things I point out in the film and this is why 1 reason MK Davis is making some of the same claims I did but he adds more to it and said it was a blood bath. For you see I gone over some of his interviews and some of the things he said in them made me think that he himself thinks the PG film is a hoax. For I made the claim there was a lot of splice marks in the film then he said he found some splice marks in the film then he said why did they splice the film together like they did. Now he even said there was something funny about the film like there was something flashing on the hill and Bob Titmus was there with Patterson and Gimlin they both Patterson and Titmus was filming then he gone on saying there was a dog there with them. Now if what he claims is true where is the dog in the film for you see now by these claims that MK Davis is telling. So my point is some of the things I found in the film are there for you see MK Davis can not show my research on the film but he can come up with new stories to tell of that day. I am going to show you something I have to send it to you but if you look at the copy of the film that John Green got there in that copy at the beginning of the Bigfoot there are two different angle shot at the beginning of his copy for at first the Bigfoot is walking to the left then the Bigfoot is walking to the right. two different angles from two different cameras I will send this to you today let me get it so I can send it to you. BIGFOOT BOOKS: Titmus was there a few days AFTER the filming, and was the first to make the thorough casting of the tracks, I think 10 of them. I believe this story, but I guess one can disagree. What we'd need to do is find out Titmus' and Green's and Dahinden's schedules to see where they were during those days. Their statements on the dates are known, and the timeline of events is in the books. 1) Footprints found on the road above Bluff Creek, and more down near the soon-to-be film site, in later August, Dahinden and Green go down there. 2) Al Hodgson of Willow Creek calls Patterson. 3) Patterson and Gimlin come to Bluff Creek in very late September or early October. 6) Bob Titmus arrives a few days later and casts the tracks. 7) A while after the film is shown in Yakima, after the winter weather cleared I think, John Green and Dahinden went down to the film site and measured the dimensions. What would your timeline be? They were all there at once? That is what MK is saying. But it is well known that the tracking dog was brought on-scene in August. LEROY BLEVINS: That is what I think is so funny the time lines they tell. Now in Bob Gimlin interview he said the next day is was raining very bad and he was talking to Patterson about going back to the site to cover the tracks but they did not go back to do that. Now if it was in a creek bed and the rain was coming down like he said then the track would not be there when Titmus got there. So you see there is a lot of things that don't sound right. To me I think they all was there and made this film and track and try to pull it off like they did. Now the reason why I say this is there is too much things these guy are saying about this film for it was told there was only the two men there but they way they all talk is like they was there with Patterson and Gimlin. I am going to put something together for you to take a look at for like I said even the films they took are different types of film. But I will let you on this 1 we will work together on this I am going to put all of the parts of film I have together and we can try to put the film in order. And by this I mean we will take parts of the film that match the same color and then place it in order to find out what part was shot first do you understand what I am talking about. We will place the same color film with the same frames and try to find what part was filmed first. I will get it together and send it to you tonight. BIGFOOT BOOKS: OK, on the film thing you mentioned last. I am not sure what sort of "Movie Converter" program I'd need to have. I've found that YouTube has no "save" or "download" option. Anyway, BOB DID COVER THE TRACKS. They went back there that night, arriving late. Bob went upstream on the road and covered the tracks with bark he pulled off some fallen trees. 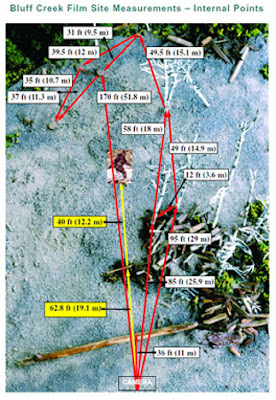 ALSO: the bigfoot was filmed UP on a sandbar, the level of which is from five to seven feet I'd estimate from the creekbed itself. It would only wash out the footprint area if it were a MAJOR FLOOD, like the one in 1964, or if the creek below where it narrows were blocked with log debris. The story DOES hold water, so to speak. I see NO problem with it at all. But then, we don't know ALL the details, do we? LEROY BLEVINS: Did you know that the Bigfoot can be seen as they was going down the road. I am going to send you a still photo with the location of the Bigfoot showing in the film as they was going down the road then I am sending part of the clip where you first see nothing and then the Bigfoot and then it is gone again but you can also see the blur it out as they did the other two men. You can see in the far ground a big red brown Bigfoot and then they blur it out in the next frame. Take a look keep looking in the location I marked on the still photo then look at the clip. Steve, I like to ask you some questions if you don't mind. Who do you believe John Green or Mr. Munns? The reason I ask this question is here you have John Green just 9 month after Oct 20 and films his research on the location and he even shows a man name Jim McC. walking in the same path as the Bigfoot and this man is 6'5" and as you see when they compare them both together side by side the Bigfoot is only about 1 or 2" bigger then Jim. Now this puts the Bigfoot around 6' 6" to 6' 7". However in the Munns report he was saying the Bigfoot was about 7' 1" or more. Now his research is done by just going over the film and the lens you was telling me about. Now in my research I did on the height of the Bigfoot I place it at 6'6" just like John Green. Now my research mach John Green on this. However again here is me and even John Green making the claim of the Bigfoot around 6' 6" to 6' 7". But Mr. Munns puts the Bigfoot way bigger that means my research and even John Greens research on this film is no good. This is why I ask the question for everyone tells me to look at the Munns report and he is putting the Bigfoot bigger then my research and even John Greens research so this tells me that even John Green don't know nothing for ever body keeps telling me to look at the Munns report. Just like in some of the e-mails you send me you tell me to look over John Greens research for he was at bluff creek and he did research on the film and the film site. Then you said look over the Munns report and this man just did his research in the film. But John Green tells a different story then Mr. Munns but who can I believe? John Green or Mr. Munns. So you see what I am saying here. Let me tell you something I have e-mailed MK Davis about my research on the film and even send him thing I found. Also yes I have even send Mr. Munns my research ans even send him part of the film I found things and I even send it to 3 other that did research on this film. now the funny thing about this is I have e-mail these men about 30 time each and none of them call me or even e-mail me back about what I found in the film. The only people that e-mai ls me back are the people that either don't believe my research or people that said look at this man research or that man research on the film and then said these guy's did a better job then me on the film. But the truth is if what I found in the film is not there or even some kind of tree as people said then why don't MK Davis or Mr. Munns or the other just come back and say no this is this or that. However none of them did. I even gone as far when I e-mail them by saying if my research is no good then you tell me and show me what they are then I will stop my research on the film. And still nothing back from them. So you see by this I have found things in the film that even they don't have no answers too. For they know what I found is what I claim is true. So you see like I said who do you believe John Green or Mr Munns? For if you believe in John Greens research then the Munns report is no good. But if you said you believe in the Munns report then that means that the research on John Green is no good. So you see that is a hard 1 to answer for now you have to believe in 1 or the other in this life in research you can't believe in both research.As for me I like John Green research better for he was there at the film site and he even shows a man at 6' 5" in the same location the Bigfoot was in so you can see the true height of the Bigfoot. But the Munns report you see a still from the film next to a women photo and yes even shot with the same kind of lens but you can always make 1 photo smaller then the other. But what John Green show you can see even the trees are the same size and all. So I go with John Greens research on this then the Munns report. Hands Down. 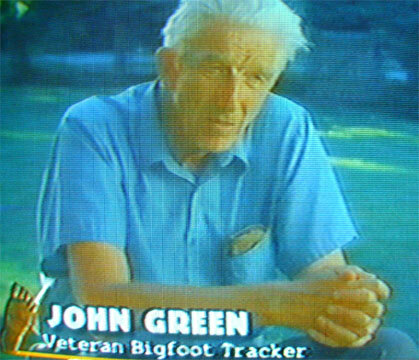 Here is the part of film by John Green research on the location of the Bigfoot. You know you said that MK Davis is wrong on what he has been claiming. But, is he? He claims there is this red bloody water and you can see it in the photo he shown. He said that Miss Patterson asked him can someone get in trouble if they shot one of these creatures. He even said there was more then one Bigfoot there. He said the Bigfoot in the film is real. You even shown him one of my photos and told him of one of my claims and you believed him when he points out things I found in the film. But you don't believe him when it come to his other researchand this was just in the last year. But you claim that MK Davis is wrong wrong wrong for the past 2 years.Now if someone is wrong about this or that then how can you believe in his other research. So you see if MK Davis was right about his other research then MK Davis is right about all of his research and not just parts. You see the man MK Davis made claims on the PG film for years and everyone believe in his research. However when he started to make more claims about the film everyone is not even backing his research no more. You can not have your cake and eat it too. It's you believe in his research or you don't. As for me if I did not find the things I did in the film I would believe in MK Davis research 100% even to this day. I think he is a very good research and he makes a lot of good points and I do think he has some very good questions that needs answers. Now if there was nothing to hide on John Green part or even Bob Gimlin part then they need to answer the questions to end all of this bad talk. Now I know for a fact that MK Davis never said anything bad about John Green or Bob Gimlin. but, I do know that John Green and Bob Gimlin said a lot of bad things about MK Davis. What they need to do is put MK Davis and John Green and Bob Gimlin in one interview and record it this way there is no hear say you will have all 3 men telling their side of the story and answer all the questions up front and put an end to all of the BS. So if there is nothing to hide then get it done. I know MK Davis will be there. No human can be 100% right all of the time. MK is a good guy, but he IS wrong about the "Theory That Dare Not Speak Its Name." That water is not red. That is off-color film distortion. I have seen better stills, no red. He contradicts his own dictum about using the best film copy. He never said anything bad about Green and Gimlin??? That is just simply ridiculous, and you surely must know it. Green just emailed me back contradicting you, too. He was being polite saying that I'm sure; but he denies EVER suggesting that the creature in the PGF was a hoax. "Of course the PGF shows a real bigfoot, and I have certainly never said otherwise, to him or anyone else." If I repeatedly say, "the world is round," but then say "the sky is orange," would you then not believe that the world is round? This is your logic re MK. When was the documentary of Sasquatch The Legend of Bigfoot filmed? I know it was released on March 9, 1977 but, when was it filmed? Why do you ask, and what does this have to do with PGF? I would assume it was 1976. Leroy, you are wrong again! I just watched your video about this film. It has been known for a while now that this movie was based upon the Roger Patterson documentary idea, but there is NO proof that Patterson was involved in this film. In fact, he was DEAD when it was produced. You will notice that the actors are TOTALLY DIFFERENT from the characters known to be in the original Patterson Yakima footage, whom you have identified (after Greg Long) as Bob Heironimus, Jerry Merrit, et al. Also, it is very clear that is NOT Bob Gimlin in the later film, just a copy of his character. Also, that photo was not TAKEN by Larry Lund, but rather just in his possession and provided by him to author, Greg Long, for his book. You REALLY have to try to stop leaping to conclusions, my friend. Directed by Ed Ragozzino. With George Lauris, Steve Boergadine, Jim Bradford. Scientists mount an expedition to find a Bigfoot-type creature. Just viewed your other video. Now, I am almost absolutely certain that the image you show is NOT the original page from the magazine. I have seen it, and it is different in my memory. Where did you get this "page"? Do you have an actual copy of the magazine? Well, I do not, but there is one here in Willow Creek and I am going to check it. I believe that this is a later side-by-side comparison of the movie stills to the Patterson filming stills, NOT a page as presented in the magazine; and those movie stills did NOT appear in said article. Ok here is the deal. As you know people claim reel 2 show Jerry M and Bob H. Well what they did not know was that it was not reel 2 I found out it was part of the documentary that Roger Patterson was making. There are other parts they show as well that people think came from the 3 reels when all they are is parts of Roger Patterson documentary. Now here you have this same documentary by Ron Olson that has the same story line as Pattersons story line. However Here you have Bob Gimlin saying that Roger was making this documentary but he had nothing to do with it. When in fact Bob Gimlin was helping Roger Patterson on his documentary for Bob Gimlin was the Indian tracker. You can not say one thing and then go to anither thing. I ask you when was the STLOB was made o find out if it was made in the 1970's or was it made before the 1970's. The reason for this is it was told that these 3 clips was in the 1968 magazine. So you see I am looking for the truth the videos I made on this was to see if someone come out to talk about this so I can find the truth about it. I am not going on Bob H words I am not going on Bob Gimlin words and I am not going on MK D research I am looking fr the truth. Now the man I was talking to was John Green himself that is the man I have been e-mailing I told you he is very well known in the Bigfoot world. He told me the Bigfoot in the PG film is BLACK and not the colors claim by everyone else. I shown him photos of my suit and here is what he said word for word. I am impressed with the effort you have made and the skills you have applied in doing it, in particular your costume, which is the closest to what the film shows that I have ever seen. I shown him my research and photos of the suit I made. So you see John Green has seen this film by Roger Patterson but, he still thinks he needed to go out and find it just to make sure there are Bigfoots. So he himself don't think the Bigfoot in the PG film is real if you have doubts. So you see it's not me that keep changing the story it's the men that was there or worked on the film is the one that changed their story. Even Bob Gimlin claim he had nothing to do with cameras and Roger had the camera with him all the time. And even to this day I don't take pictures. This is right from Bob Gimlin mouth in an interview. If you like looking for the facts then why don't you bring these questions up with Bob Gimlin or the others. Leroy, I've told you a dozen times, that is NOT Reel 2. OK? I've talked with John Green about it, and he says there was no footage of Bob H. and Jerry M.--that was from YAKIMA, shot earlier that summer. OK, reading further. YOU said it was Reel 2, but now after talking to me you admit that it was from the documentary? There were NOT three reels from Bluff Creek, only TWO. So now you agree with me! Re. Argosy--SHOW ME THE ORIGINAL PAGES. I will try to get time to check today in the Willow Creek copy. Now, re. John Green, he DOES NOT THINK THE FILM IS A FAKE. Show me his email that says that. All he says is that your suit is pretty good. I talk to him, too, by the way. I think I have a quote from him about your research somewhere. He did not say a favorable thing, as I recall. Bob Gimlin may just not remember everything correctly. That is not telling lies, that is just getting old. I don't know what to say about his statements. Yes, they do sometimes contradict things. No human memory is perfect, and still, it proves nothing. We talked about it when we was IMing one another. And that is what I have always said the truth is what I am looking for and that is why I ask you questions about it and after you told me then I took the videos off of here. And I have always said that if I am wrong about something then I will say it that I was wrong. But. if you remember in the videos I said THEY CLAIM and it was not what I claim it was THEY CLAIM. So if you think about it I was not wrong about it the people that made that claim was wrong about it. I have watch those videos just now and if you read it they said THEY CLAIM. It was not my claim it was their claims. So you see if I don't know something I write they claim until I find the truth and then I will make a claim and say I did this or that and seen this or that. but, until then I will start off with they claim. Just like Patterson and Gimlin claim they was the only two men there and then Bob Gimlin claims he don't use cameras so there had to be someone there with them to film Patterson. Then Patterson claim he and his horse fell to the ground with his horse on top of him. But Bob Gimlin claim that never happen. So who can you believe Patterson or Gimlin? So you see a claim is just that a claim that is why we take these claims and put them to the test to find out the truth for the men that was there are both liars and I can prove it. FACT. OK. Anyway, when you publish a video you are making a statement of advocacy, one way or another. If you quote your sources then it will be clear that you are presenting what someone else has said. I could only assume that you were saying that the Sasquatch: The Legend of Bigfoot and the PGF films were shot at the same time. If I thought that then I can assure you that all the others looking at your stuff thought the same, for the most part. You can say "liar" all you want, but it is a known fact that stories change with the telling, and some details are emphasized while others or not, and at times memory differs. In fact, based on this, WE ARE ALL LIARS. I could say Leroy Blevins "lied" about so many things that you have said in your research in the past but have since changed. But I wouldn't call you a liar--that is just the way it goes as we find out things along the way and make new theories. Your constant attack on Gimlin, calling him a liar all the time, is just plain mean-spirited, in my opinion. Had enough yet? We sure had. Anyway, the last bits of this conversation spread off onto the JREF Forum. Read some of that starting HERE. See our previous blog entry HERE for more continuation, where we asked Larry Lund and John Green about all of this. Egads!!! BOOK STORY OF FEMALE BIGFOOT SEEN BY COWBOYS AND FILM RELATED? COMPARES FACES BOOK FILM--NOT THE SAME! ASSUMES ARGOSY FEB. 1968 ARE FROM REEL 2... NOT, YAKIMA! other man Jerry Merrit. NOT, where do you get this reel ascriipton? can't tell color or pattern of small bit shown! ROGER NOT BOB... WHY? BOB FILMED IT???? BUT THEN, WHY CLAIM HE IS IN THE BUSHES LATER??? used in movies, must have been used in PGF ??? Claims body is from 1966 wolfman movie, just because similarly shaped. and they place the zipper in back and not in front." Leroy, did it ever occur to you that "what can be seen" may not be the truth either? The eyes can fool you, the mind can play tricks on you, the imagination can take over. It is well known that perception is relative. It is an approximation to reality. Photos are even more subject to interpretation, as there are the issues of blur and perspective and context to consider. Leroy Blevins: Do I have proof to show if the story was true? no I don't. ...You see this is why I always say a story is just that a story it is nothing but, words and there is no way anyone can show proof on words. ... So you see this is why I say a story is just a story and theories are just a theory but, proof is what can be seen and not told. Here's how. My responses below in capitals. I found and show two frames that shows another man hat." "I found and show Bob Gimlin standing behind the brush." THIS IS PURE PAREIDOLIA, AS GIMLIN WOULD HAVE TO BE HUGE TO APPEAR ESSENTIALLY THE SAME SIZE AS THE CREATURE WHILE SITTING SOME APPRX. 40-60 FEET BACK INTO THE BRUSH. 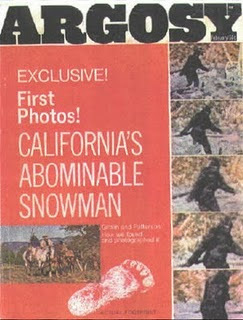 PLUS, IF IT WAS HOAXED, WHY WOULD THEY RUIN IT WITH A GUY IN THE BUSHES? I ALSO "FOUND" AND "SHOWED" TO YOU HOW THERE IS ANOTHER "GUY" SITTING RIGHT IN FRONT OF GIMLIN, AND THEN A BUNCH OF TINY DANCING BABY BIGFOOTS ALL AROUND HIM. ARE THESE ALL TRUE THINGS, THEN? "I found and show the Bigfoot stopped 9 time in the footage." HUH? I SEE A CREATURE MOVING QUITE NATURALLY THROUGH THE WHOLE FILM. HOW DID YOU "PROVE" THIS? "I found and show two other men images taken out of the footage." AGAIN, WHY WOULD THEY BE THERE? LOOK AT THE OTHER FRAMES AND YOU WILL SEE THESE ARE JUST BLURRED WOOD DEBRIS OBJECTS. IF THEY WERE REALLY MEN THEY WOULD ALSO BE AS BLURRED AS THE WOOD ON THE GROUND. ALSO, PLEASE EXPLAIN THIS COMPLEX TECHNIQUE OF BLURRING SOMETHING OUT WHILE LEAVING SHADOWS BEHIND, YET LEAVING THEIR WATCHES VISIBLE. "I found and show the Bigfoot was a man in a suit." OH, SO BY REVERSE ENGINEERING YOU COPIED SOMETHING. THAT PROVES NOTHING. IF, JUST MAYBE, THE FILM SUBJECT IS REAL, THEN YOU HAVE ONLY COPIED SOMETHING WITH AN IMAGE OF IT, JUST AS AN ARTIST PAINTS OR SCULPTS A REASONABLE APPROXIMATION OF REALITY. THE ARTISTIC PRODUCT SHOULD NOT BE CONFUSED WITH REALITY. JUST BECAUSE A MAN CAN FIT IN YOUR SUIT DOES NOT MEAN THERE WAS A MAN POSING IN A SUIT AS THE ORIGINAL SUBJECT. "I found and show the film was filmed by someone right handed and left handed." HOW IN THE WORLD DID YOU PROVE THIS? AND ARE YOU SURE OF WHICH HAND PATTERSON FAVORED? THE MINUTE SHIFT FROM ONE SIDE OF THE HEAD TO THE OTHER WOULD MAKE NO NOTICEABLE DIFFERENCE IN THE FINAL VIEW AND PERSPECTIVE OF THE FILM. "I found and show the film was part taken out from Roger Patterson documentary." YOU HAVE DONE NOTHING OF THE SORT. YOU HAVE ONLY SHOWN THAT PATTERSON MADE FILMS ABOUT BIGFOOT, WHICH WE ALREADY KNEW. ONE WAS A PROJECT MADE EARLIER (AND KNOWING PATTERSON, PROBABLY ABANDONED FOR NEW THINGS), THE OTHER A FILM OF A SUBJECT ON AN EXPEDITION TO FIND SUCH A SUBJECT. PERHAPS PATTERSON HOPED TO INCLUDE THE FOOTAGE OF SCENERY AND BIGFOOT HUNTING IN THE DOCUDRAMA, BUT AGAIN, HE FILMED LOTS OF OTHER STUFF ON HIS TRIPS THAT WAS NOT STRICTLY OR AT ALL A PART OF THAT PROJECT WITH GIMLIN AS AN INDIAN GUIDE, ETC. 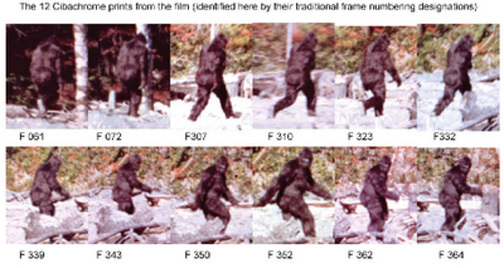 IF THE PGF FOOTAGE WERE FOR THE DOCUMENTARY, WHY WAS GIMLIN NOT WEARING HIS INDIAN WIG??? ALSO, THERE WAS A SIMPLE *INFLUENCE* OF IDEAS BETWEEN PATTERSON'S ORIGINAL PLANNED FILM AND THE ONE OLSON EVENTUALLY MADE. "I show the test I did." YOUR "TESTS" ALL FAIL KNOWN HISTORICAL AND SCIENTIFIC METHODS, IN MY OPINION. IT SEEMS, RATHER, THAT YOU COME UP WITH A THEORY FROM YOUR IMAGINATIVE PERCEPTIONS OF BLURS AND BLOBS IN THE FILM, AND THEN MAKE UP STORIES TO SUPPORT IT. I COULD PROBABLY SAY THAT THERE IS ANOTHER NOAH'S ARK THERE ON THE FILM SITE, AND "PROVE" IT, IF ONLY I "LOOKED" HARD ENOUGH. "I even made a copy of the suit they claim no one can make. This is what I found and did." AGAIN, THIS PROVES NOTHING. TO ME YOUR SUIT LOOKS JUST ONE SMALL STEP UP FROM THE COMMON CRUD RELEASED AS CHEAP GORILLA COSTUMES FOR HALLOWEEN. LOOK AT THE PHOTO PARCHER POSTED ABOVE, IN FRONT OF THE BRICK WALL--IT LOOKS UTTERLY FAKE AND RIDICULOUS. ALSO, IF YOU REVERSE-DESIGNED A UFO, WOULD IT FLY? YOU CAN MAKE A THING THAT *LOOKS* LIKE A REAL ALIEN SPACECRAFT, BUT THAT DOESN'T MEAN IT CAN FLY. Words, critical and contextual thinking, knowledge of the historical record and facts, and basic literacy and patience of mind are all beneficial and good, and are the tools of a mature mind. Language is, after all, the basis for your thought and ascription of meaning to things. Your disparagement of "words" leaves me feeling highly suspicious that you have a bias against their proper use, against the process of rational thought, perhaps tainting your image-based pareidolic research. Quotes from John Green may serve to end this all-too-massive blog entry. Why does every crazy need to be refuted? MK and Paulides had earlier acquired a following with their work in this field so they needed to be answered when they went astray, but who is this guy that anyone should worry about him? "MKD" has informed us that his Theory, heretofore known as "The Bluff Creek Massacre," was not ever a "massacre" theory, and that he in any case never called it by that name. He does not want us or anyone to call it that any longer. There never was, we guess, a "massacre." We would therefore like to disavow all prior references on this blog's pages to this theory as such. We will now try to find a new name for it that will be acceptable to Mr. D., as well as recognizable to all in the Bigfoot Community, who should know what the heck we are talking about whenever we mention this particular set of ideas about what happened in Bluff Creek in 1967 (or was it 1964 now, MKD?). WE HAVE ASKED MKD FOR AN OFFICIAL NAME. He has not gotten back to us on this issue yet, though many emails were exchanged back and forth. We could call it "THE-THEORY-FORMERLY-KNOWN-AS-MASSACRE," but he wouldn't like that either. We're trying to be accommodating here, really! Now, if YOU have a better name for the theory, please comment or drop us an email. For now we will just have to call it the "BLUFF CREEK 'BLEEP' THEORY." Any reference to this theoretical construct that may appear above is part of an interview conducted a long ways back now, and we cannot be held accountable for everything in it, especially if Mr. Blevins said it. We DO hope you understand. We just want to ask one thing here for now: IF IT WASN'T A "BLEEP," THEN WHAT WAS IT? A Bigfoot slaughter? A self-defensive aggression with collateral hairy-humanoid damage? The Titmus-Green-Dahinden-Patterson-Gimlin Illuminati Bury-the-Evidence Confab? The Theory that Dare Not Speak Its Name? WHAT DO WE CALL THE DARN THING???? What is Pareidolia, you ask? READ PART ONE OF THIS INTERVIEW HERE FIRST! Me try reason with Leroy. Me stand there right in road for four minute so he see me, me say me NOT some Edomite. Me not even believe God. Me no need. Me shrug shoulder. Me walk away, leave stink behind for him. What me do? He no listen, never will, he stare at blurry picture all day when he maybe could talk to real Bigfoot who KNOW what happen. Me there when they make film. She hot babe Bigfoot, girlfriend at time. @1, that's a horrible, hurtful comment to make. How dare you speak so ill about a bag of hammers. The height to head ratio of an erect patty is 6 to 1 thats a fact..Bob H. is claiming that in his costume he stands 6 foot 7. he also states he 6 foot 2 and the costume adds 5 inches to his height.That added height comes from the height of the head of the costume to allow for the added height of skull crown and to allow for a mans head to fit in the costumes head.Here's a big problem multiply 15 inches x 6 thats 90 inches thats 7 foot 6 inches. For Bob to be telling the truth the maximum height of the head of the costume would be 12 inches based on Bob's claim that he stood 6 foot 7 in the costume. you cant allow for.the needed height of the skull crown and fit a mans head thats 6 foot 2 in a space thats 12 inches tall..if my 15 inch dimension is off please reply...though if the height of the head of that costume is anywhere close to 15 inches that rules out Bob H. telling the truth...I'll believe math before i believe Bob.